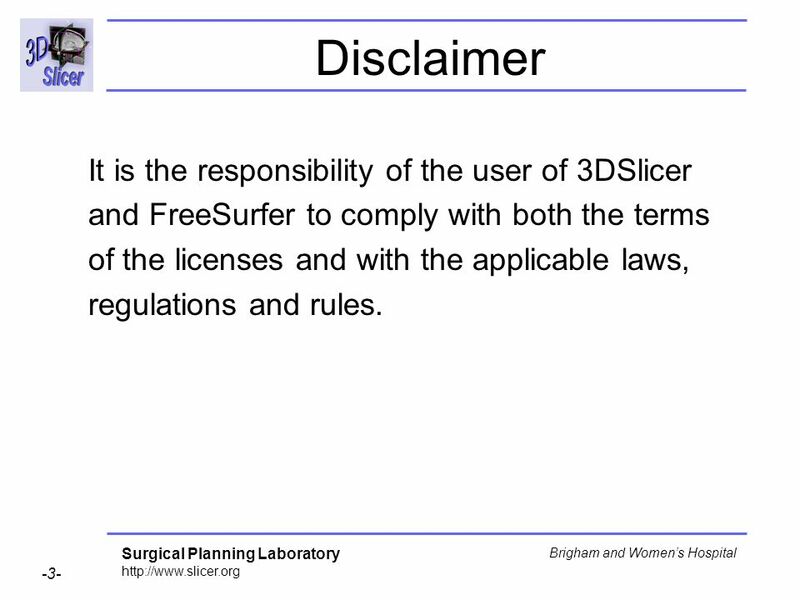 Sonia Pujol, Ph.D. Randy Gollub, M.D., Ph.D.
and FreeSurfer to comply with both the terms of the licenses and with the applicable laws, regulations and rules. 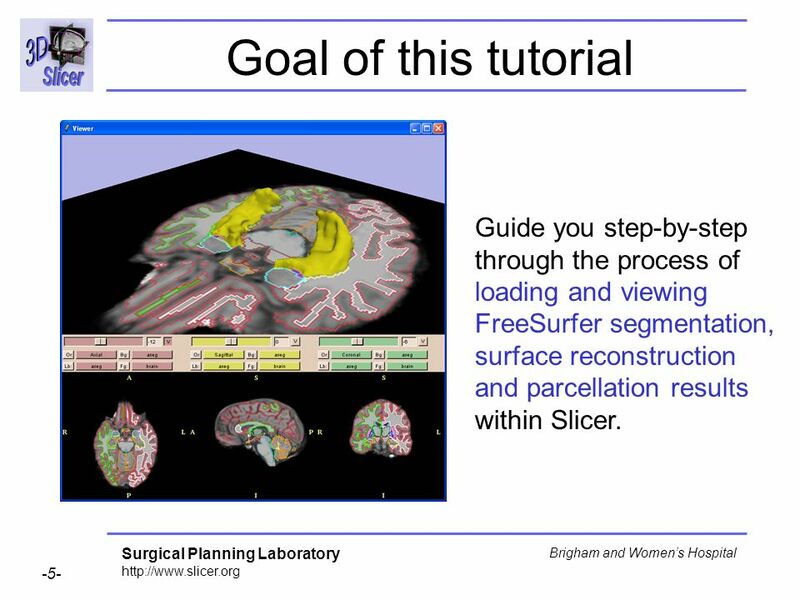 5 Goal of this tutorial Guide you step-by-step through the process of loading and viewing FreeSurfer segmentation, surface reconstruction and parcellation results within Slicer. 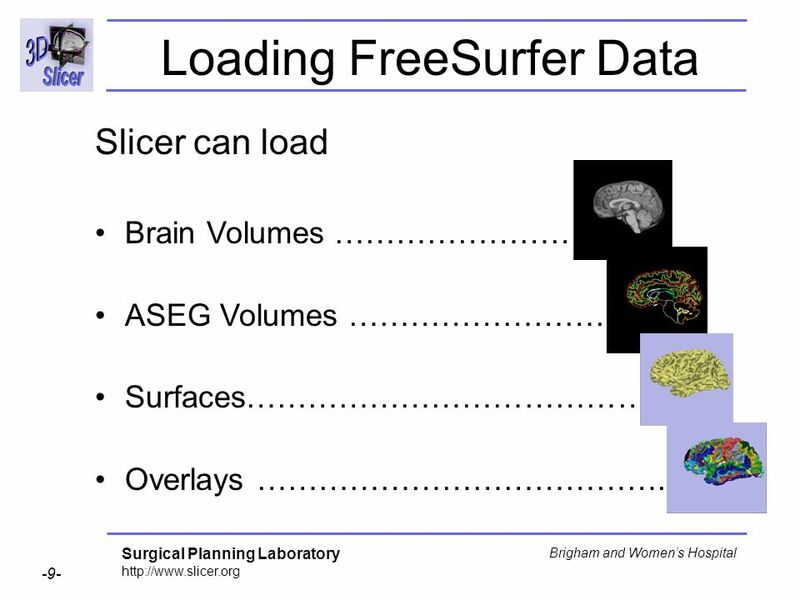 Slicer can load Brain Volumes ……………………. 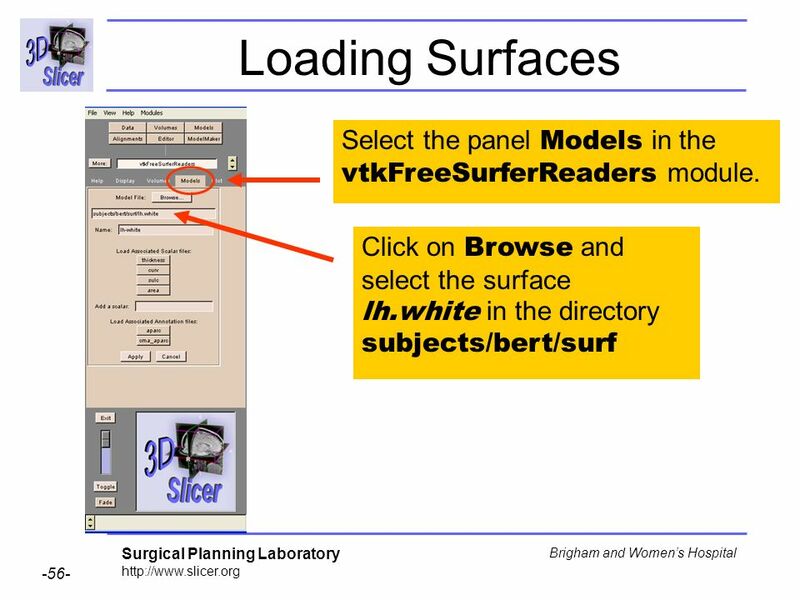 ASEG Volumes ……………………… Surfaces………………………………… Overlays …………………………………. 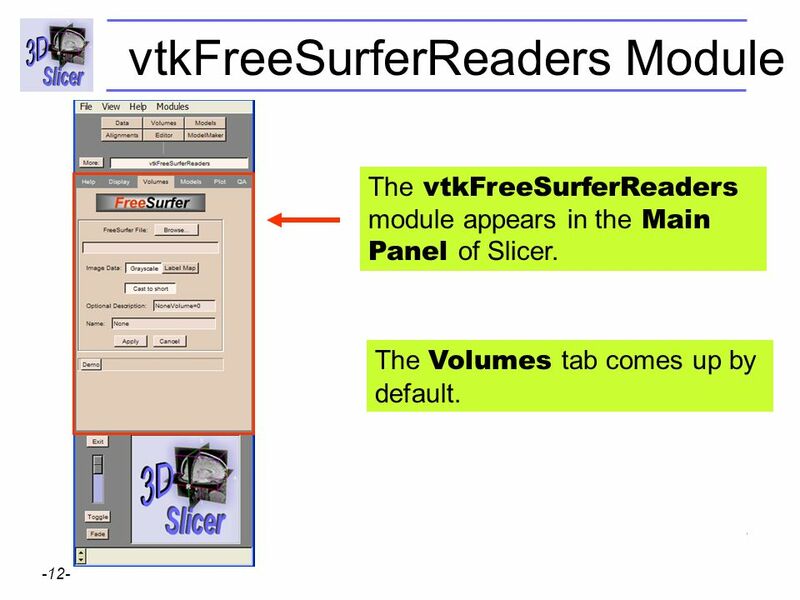 The vtkFreeSurferReaders module appears in the Main Panel of Slicer. The Volumes tab comes up by default. 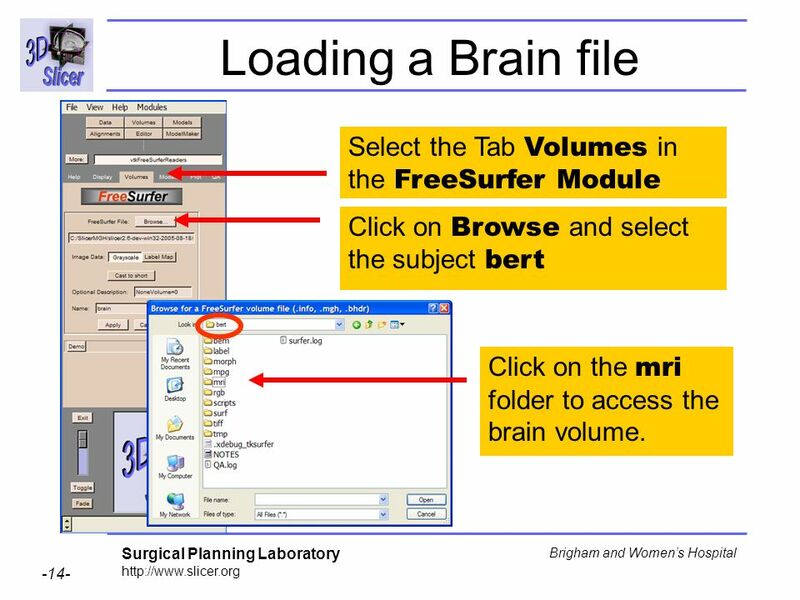 Click on Browse and select the subject bert Click on the mri folder to access the brain volume. 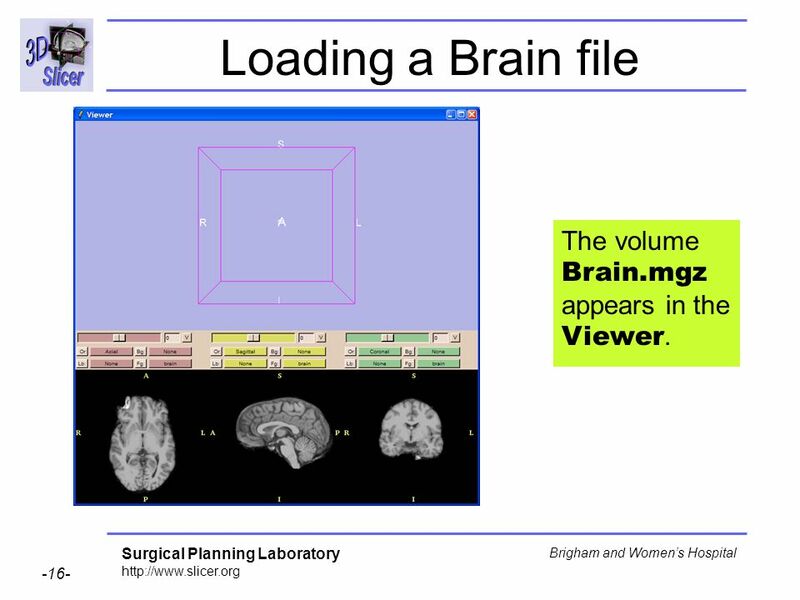 16 Loading a Brain file The volume Brain.mgz appears in the Viewer. 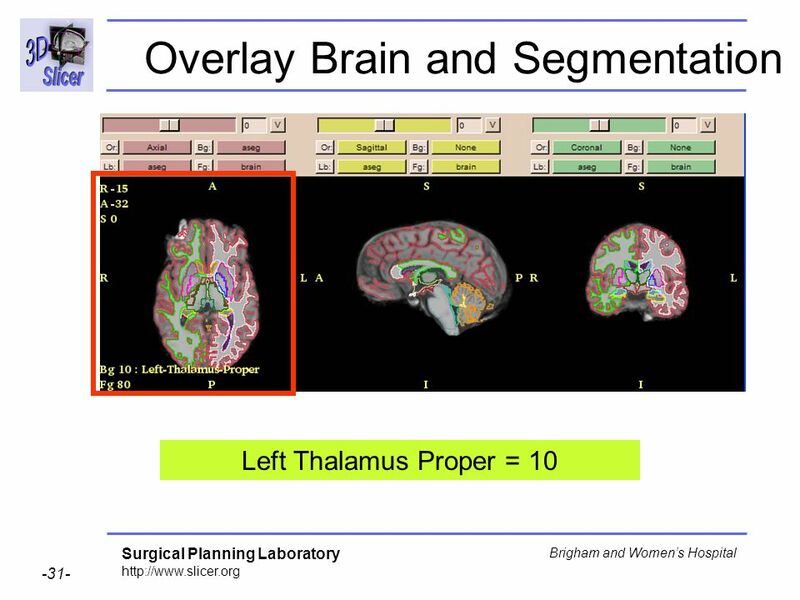 17 Loading a Brain file Click on the V buttons in the Axial, Sagittal and Coronal views. 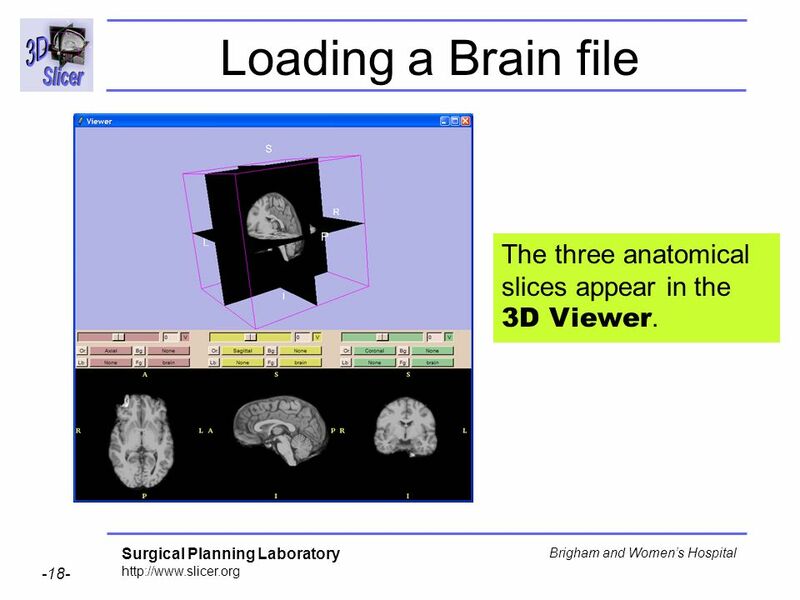 18 Loading a Brain file The three anatomical slices appear in the 3D Viewer. 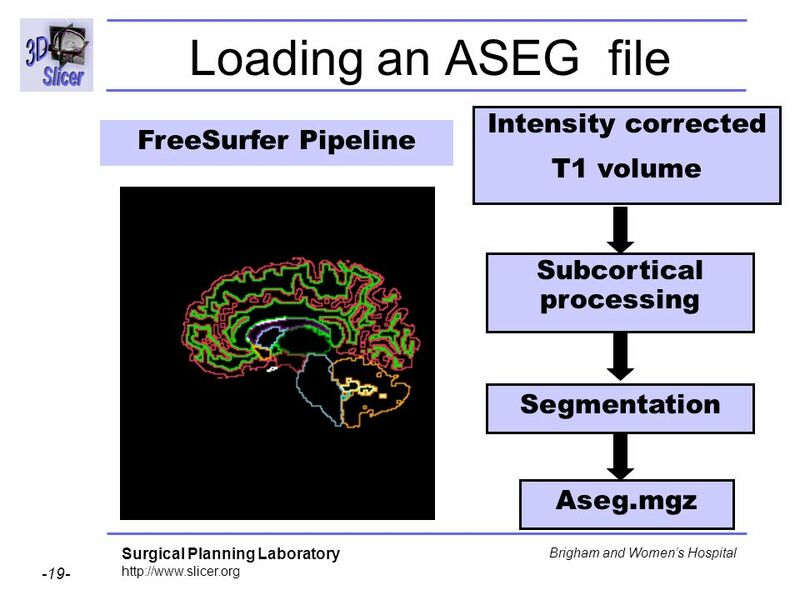 20 Loading an ASEG file Select the Tab Volumes in the FreeSurfer Module. 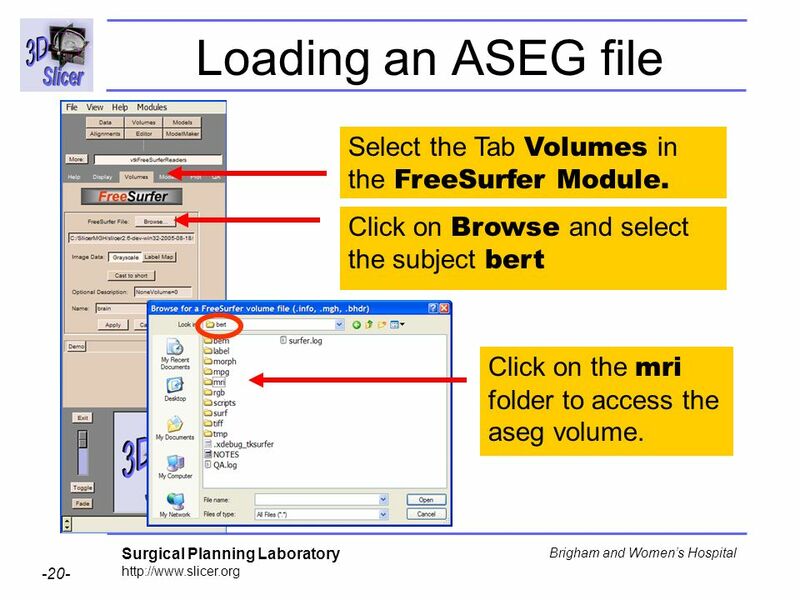 Click on Browse and select the subject bert Click on the mri folder to access the aseg volume. 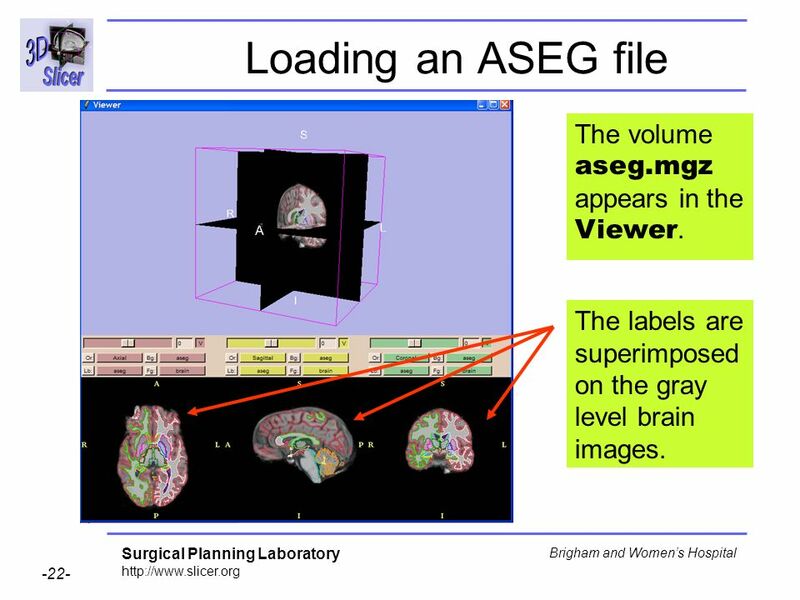 22 Loading an ASEG file The volume aseg.mgz appears in the Viewer. 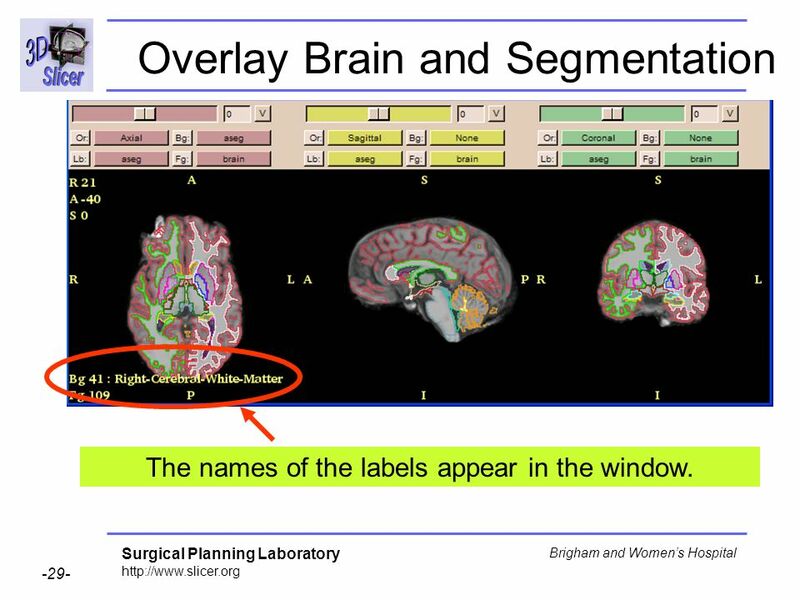 The labels are superimposed on the gray level brain images. 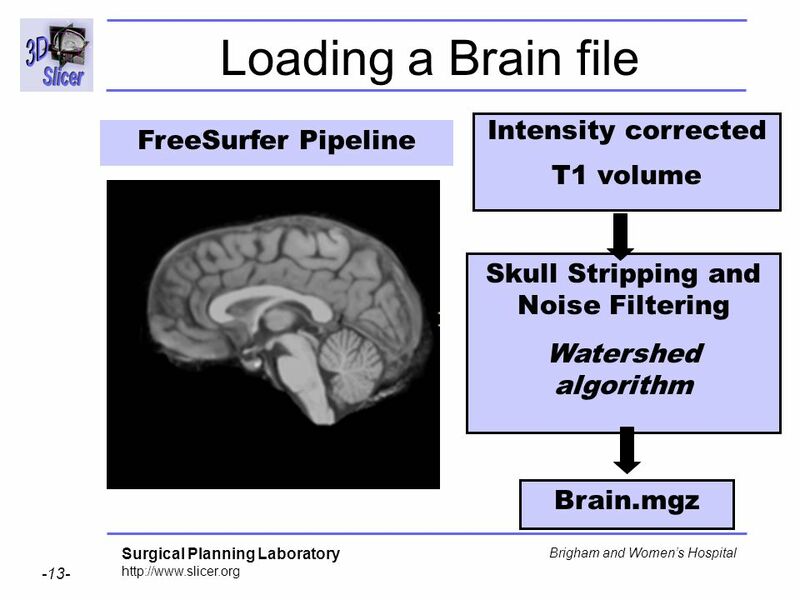 # ColHeaders Index SegId NVoxels Volume_mm3 SegName Mean StdDev Min Max Range Left-Cerebral-Exterior Left-Cerebral-White-Matter Left-Cerebral-Cortex Left-Lateral-Ventricle Left-Inf-Lat-Vent Left-Cerebellum-Exterior Left-Cerebellum-White-Matter Left-Cerebellum-Cortex Left-Thalamus Left-Thalamus-Proper Left-Caudate Left-Putamen Left-Pallidum rd-Ventricle th-Ventricle Brain-Stem Left-Hippocampus Left-Amygdala Left-Insula Left-Operculum Line Line Line CSF Left-Lesion Left-Accumbens-area Left-Substancia-Nigra Left-VentralDC Left-undetermined Left-vessel The file aseg.stats gives the list of the available segmented structures in the dataset. Example of the first 30 structures. 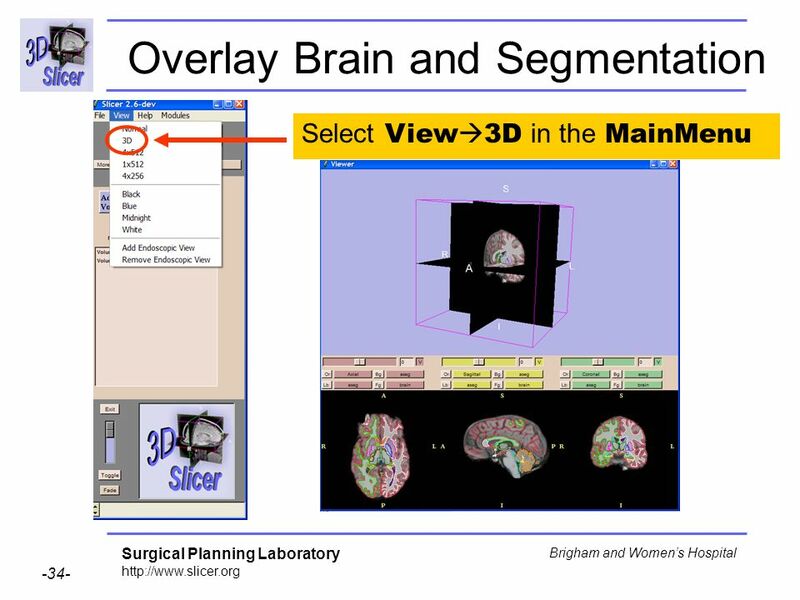 # ColHeaders Index SegId NVoxels Volume_mm3 SegName Mean StdDev Min Max Range Left-Cerebral-Exterior Left-Cerebral-White-Matter Left-Cerebral-Cortex Left-Lateral-Ventricle Left-Inf-Lat-Vent Left-Cerebellum-Exterior Left-Cerebellum-White-Matter Left-Cerebellum-Cortex Left-Thalamus Left-Thalamus-Proper Left-Caudate Left-Putamen Left-Pallidum rd-Ventricle th-Ventricle Brain-Stem Left-Hippocampus Left-Amygdala Left-Insula Left-Operculum Line Line Line CSF Left-Lesion Left-Accumbens-area Left-Substancia-Nigra Left-VentralDC Left-undetermined Left-vessel The label #10 represents the Left-Thalamus Proper. 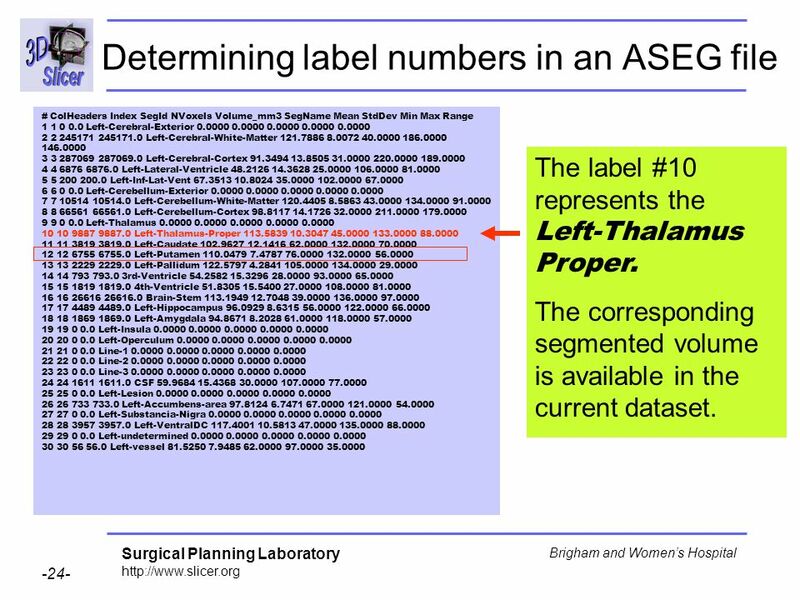 The corresponding segmented volume is available in the current dataset. 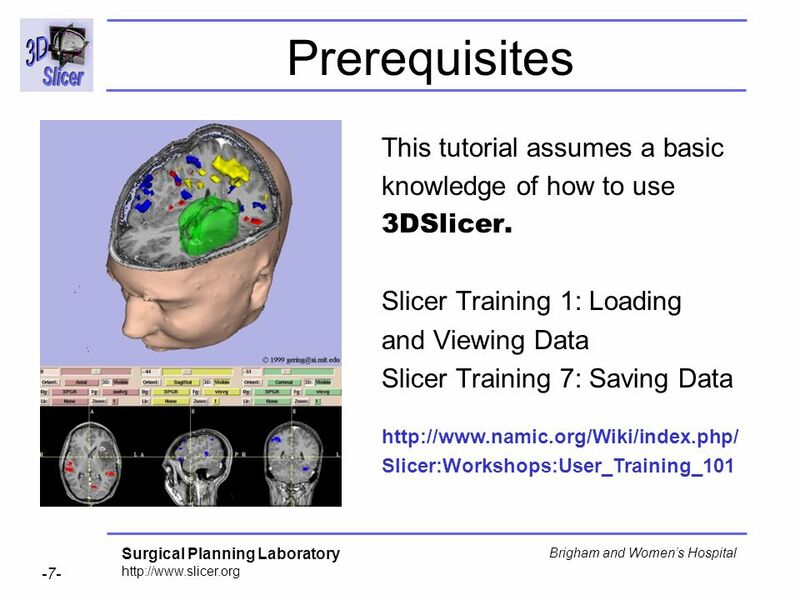 # ColHeaders Index SegId NVoxels Volume_mm3 SegName Mean StdDev Min Max Range Left-Cerebral-Exterior Left-Cerebral-White-Matter Left-Cerebral-Cortex Left-Lateral-Ventricle Left-Inf-Lat-Vent Left-Cerebellum-Exterior Left-Cerebellum-White-Matter Left-Cerebellum-Cortex Left-Thalamus Left-Thalamus-Proper Left-Caudate Left-Putamen Left-Pallidum rd-Ventricle th-Ventricle Brain-Stem Left-Hippocampus Left-Amygdala Left-Insula Left-Operculum Line Line Line CSF Left-Lesion Left-Accumbens-area Left-Substancia-Nigra Left-VentralDC Left-undetermined Left-vessel The label #19 representing the Left-Insula. 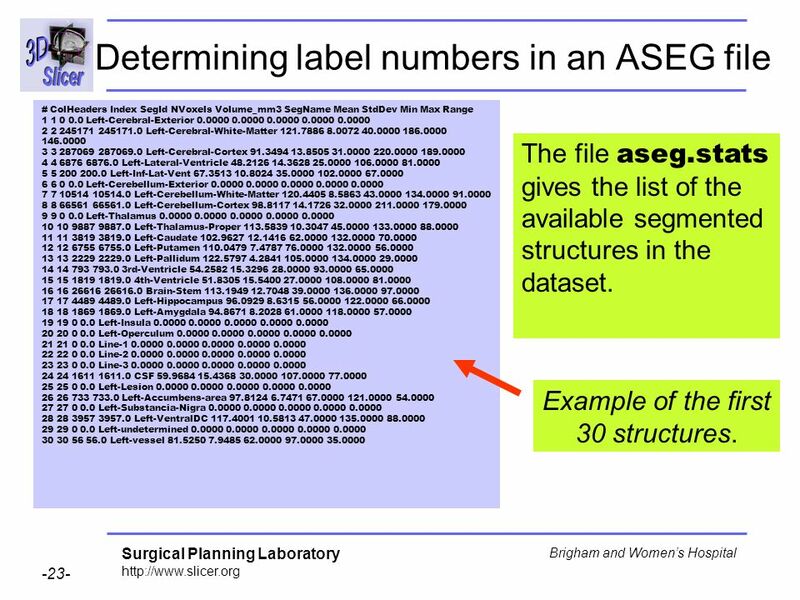 The corresponding segmented volume is not available in the current dataset. 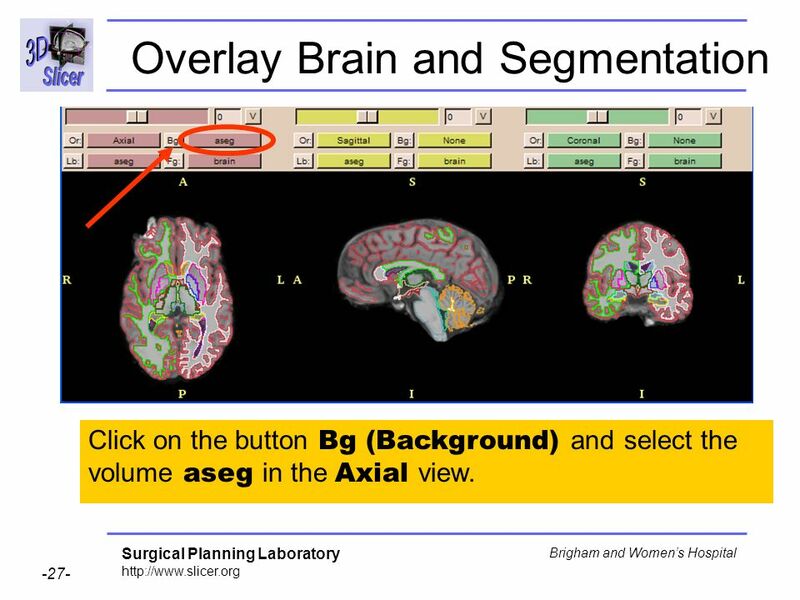 Click on the button Bg (Background) and select the volume aseg in the Axial view. 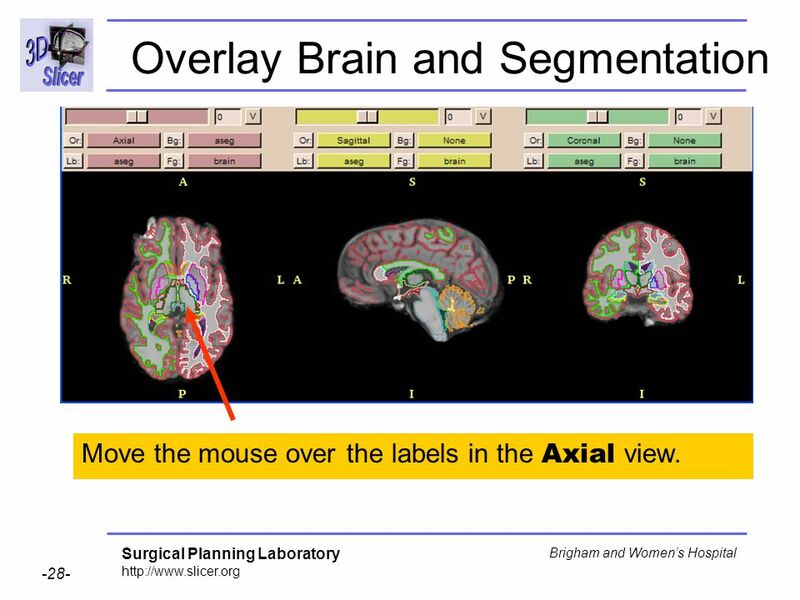 Move the mouse over the labels in the Axial view. The names of the labels appear in the window. 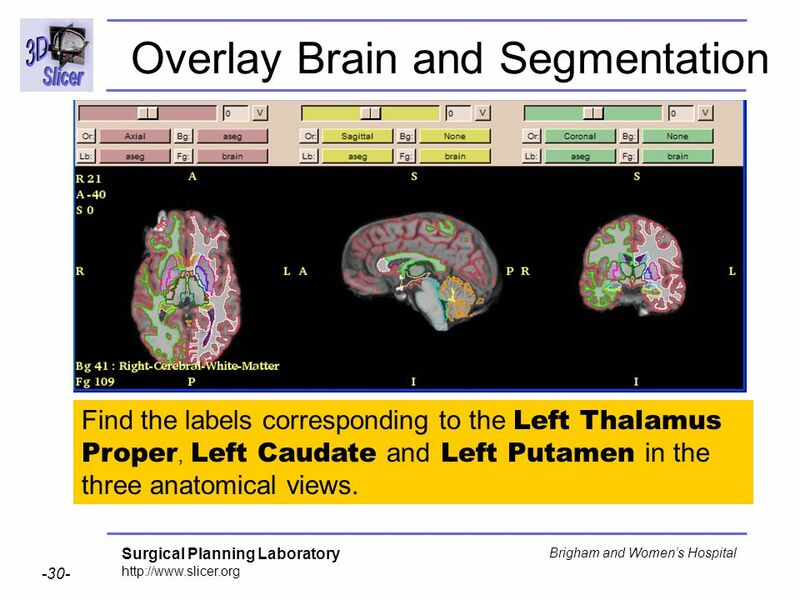 Find the labels corresponding to the Left Thalamus Proper, Left Caudate and Left Putamen in the three anatomical views. 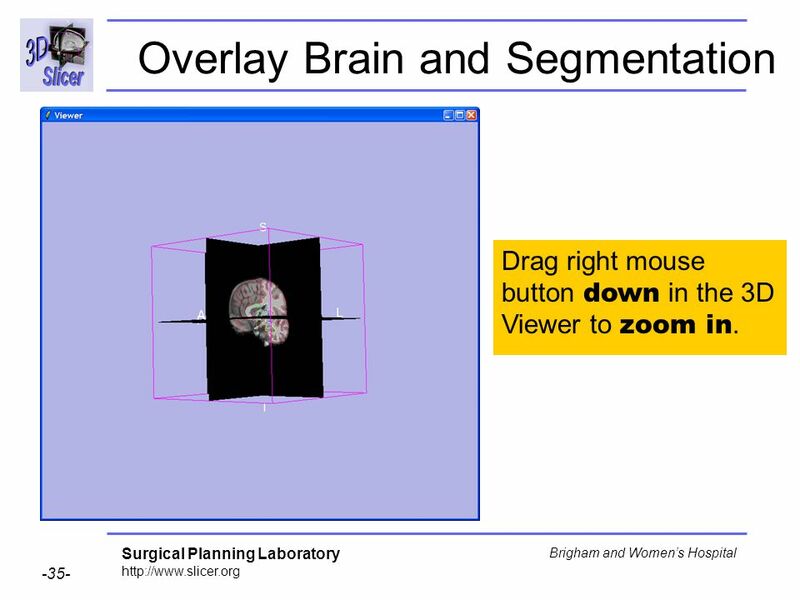 Drag right mouse button down in the 3D Viewer to zoom in. 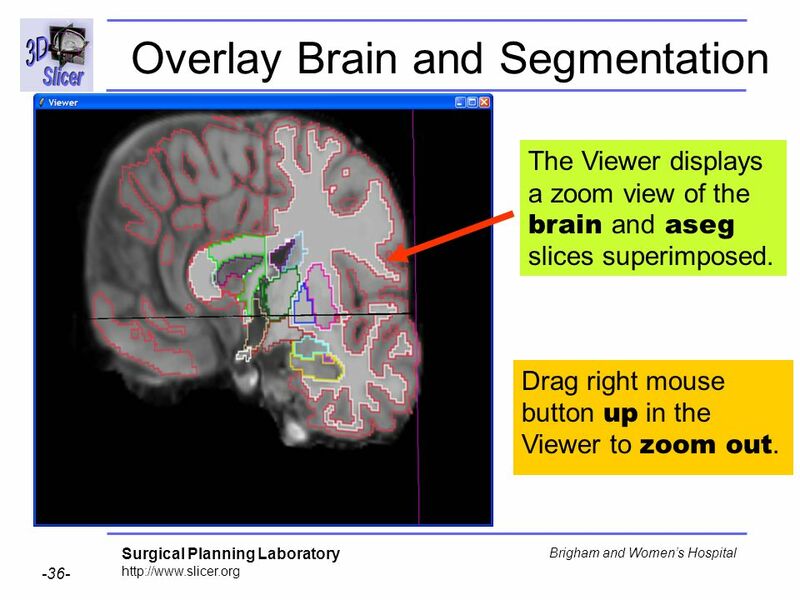 The Viewer displays a zoom view of the brain and aseg slices superimposed. Drag right mouse button up in the Viewer to zoom out. 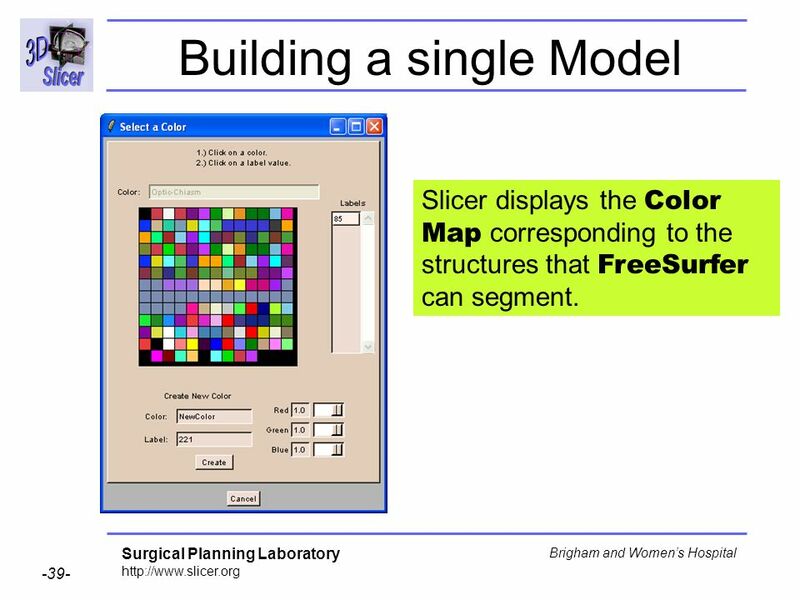 Slicer displays the Color Map corresponding to the structures that FreeSurfer can segment. 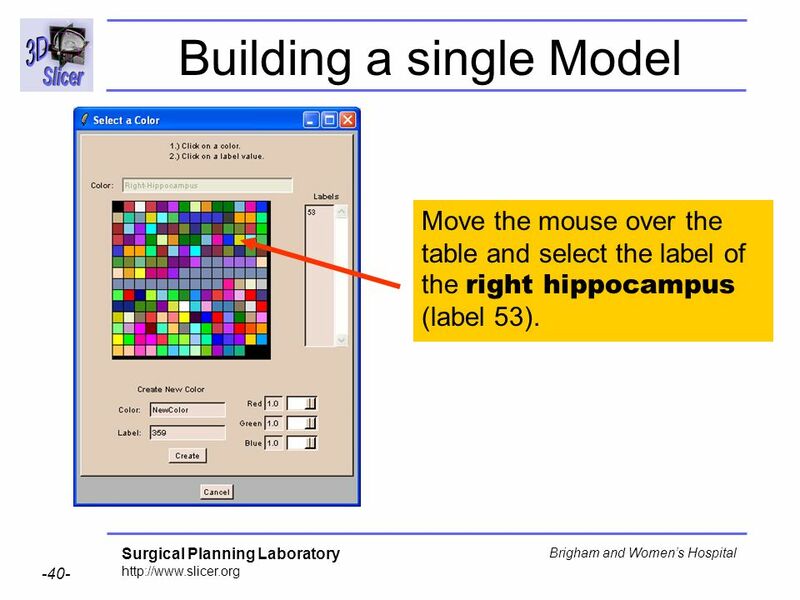 Move the mouse over the table and select the label of the right hippocampus (label 53). 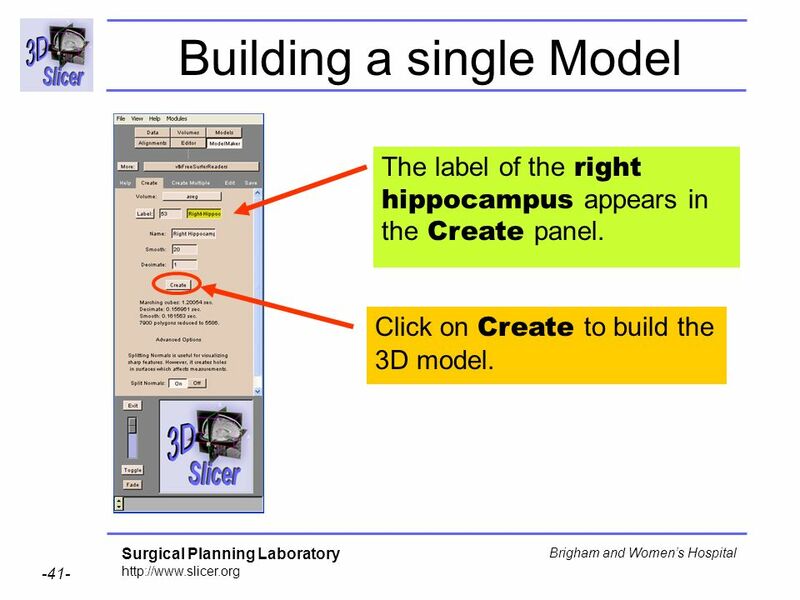 The label of the right hippocampus appears in the Create panel. 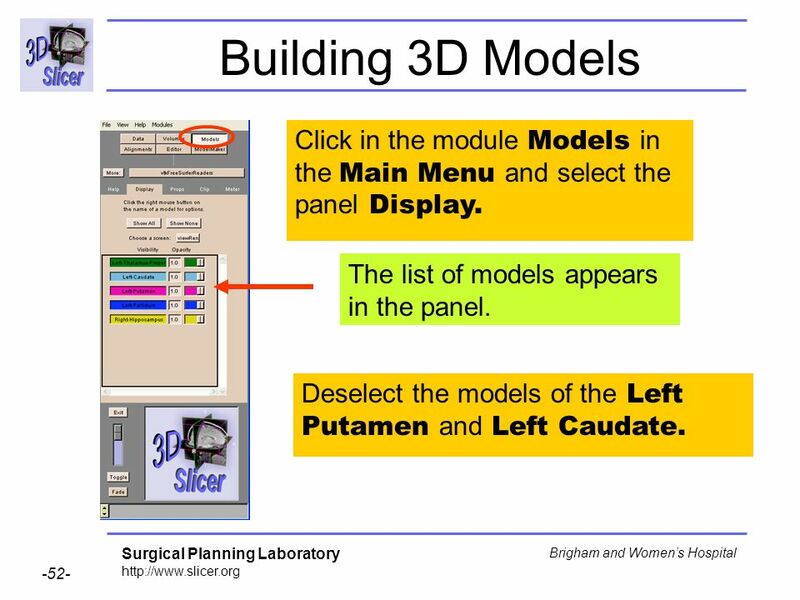 Click on Create to build the 3D model. 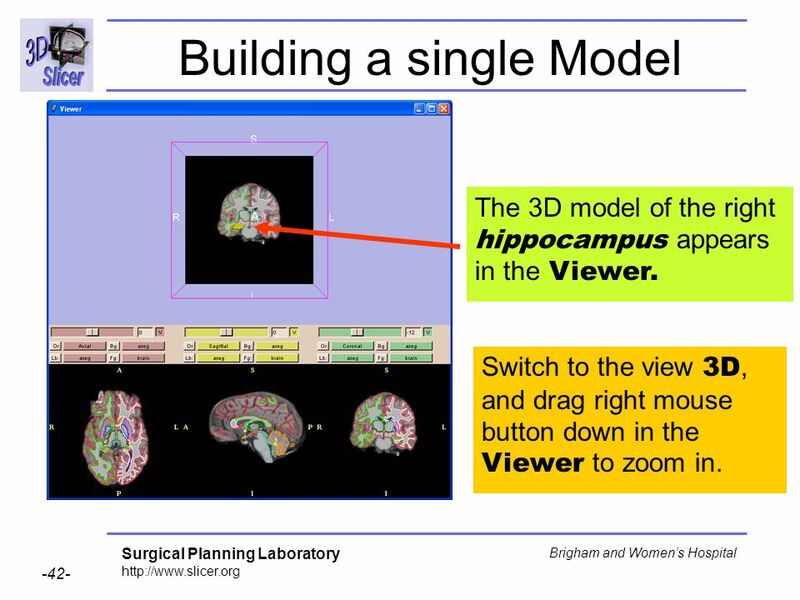 The 3D model of the right hippocampus appears in the Viewer. 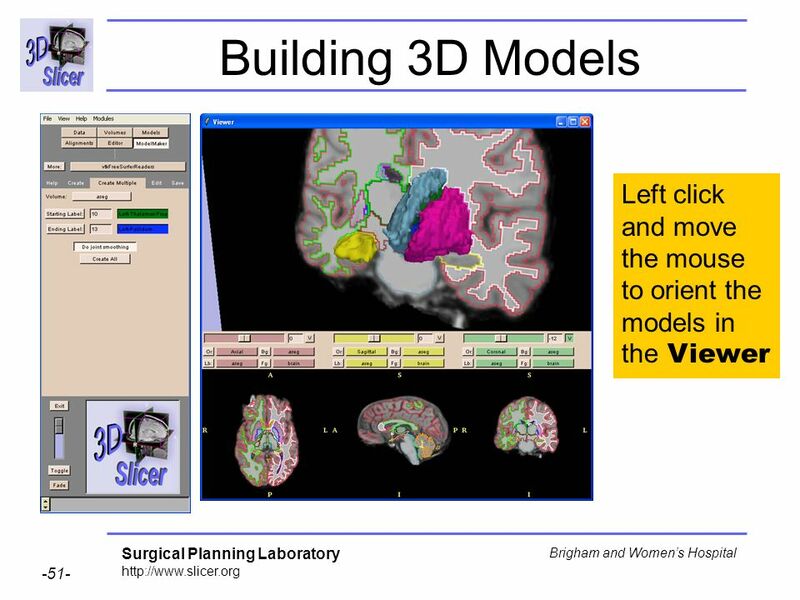 Switch to the view 3D, and drag right mouse button down in the Viewer to zoom in. 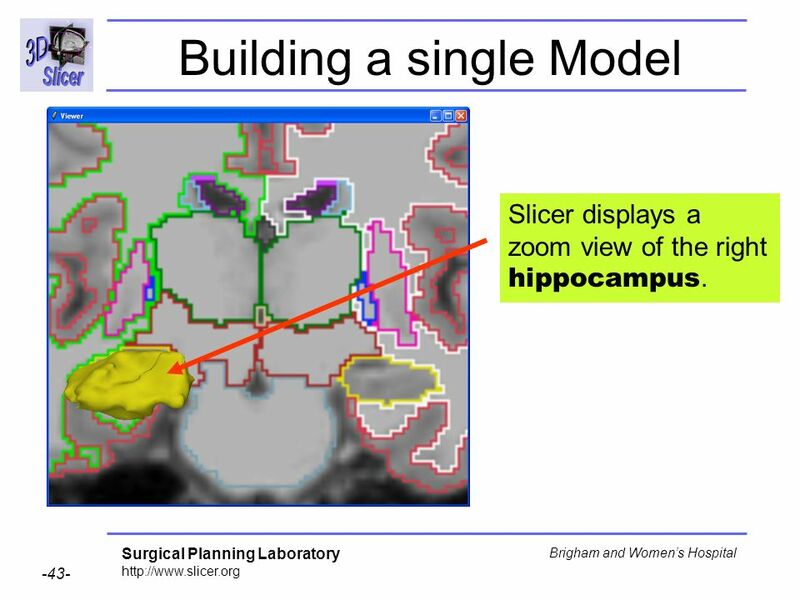 Slicer displays a zoom view of the right hippocampus. 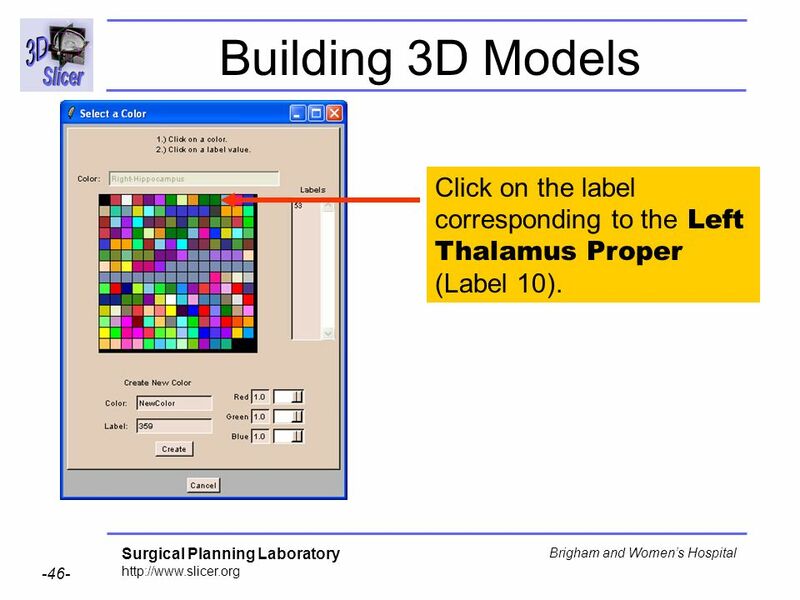 46 Building 3D Models Click on the label corresponding to the Left Thalamus Proper (Label 10). 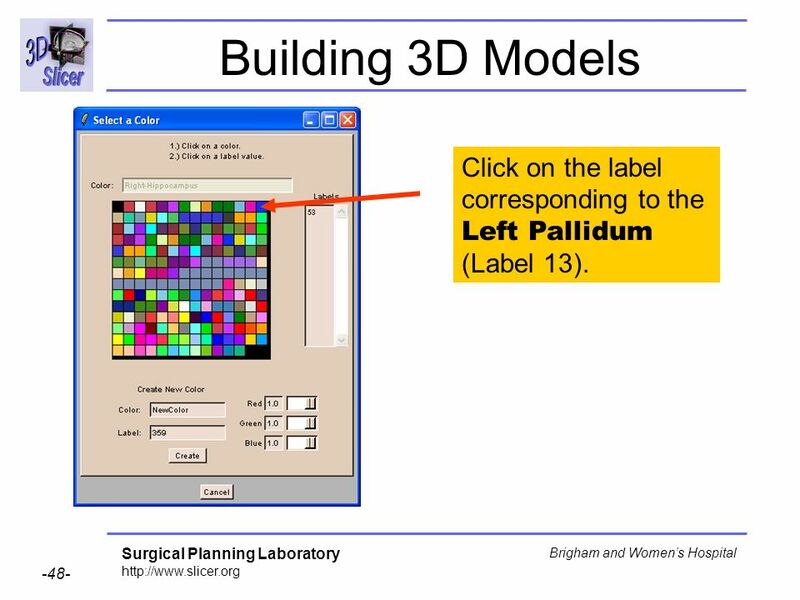 48 Building 3D Models Click on the label corresponding to the Left Pallidum (Label 13). 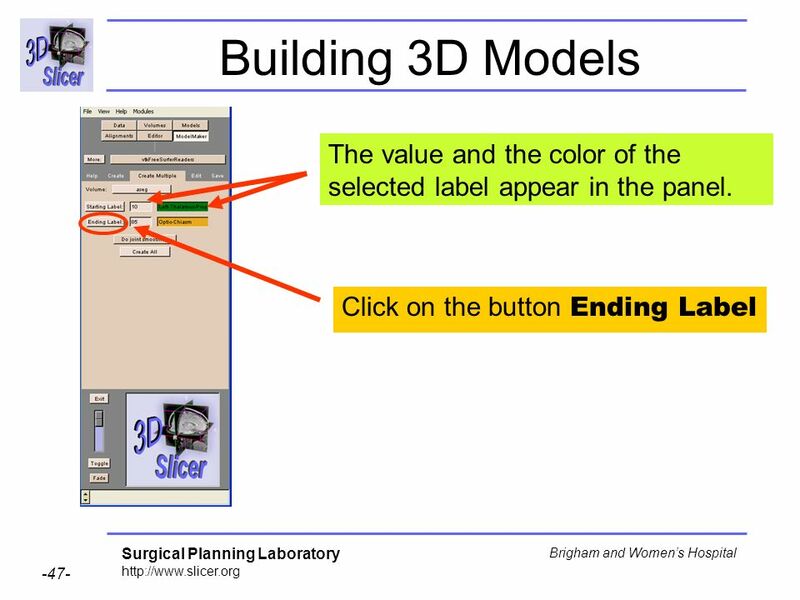 49 Building 3D Models Click on Create all to build the 3D models of the selected labels. 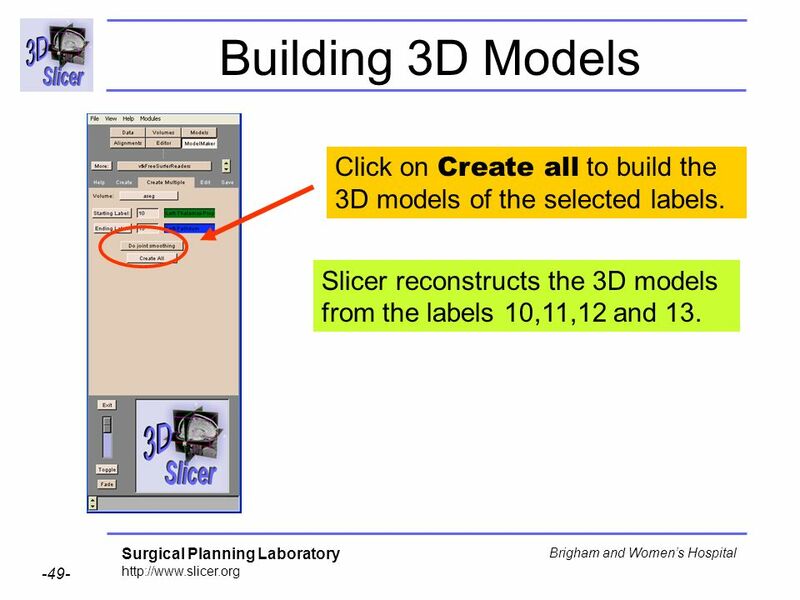 Slicer reconstructs the 3D models from the labels 10,11,12 and 13. 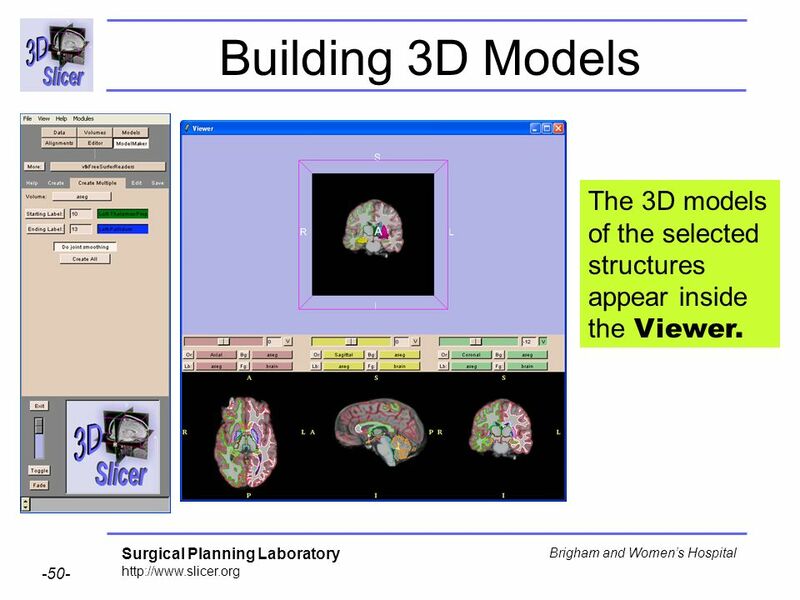 50 Building 3D Models The 3D models of the selected structures appear inside the Viewer. 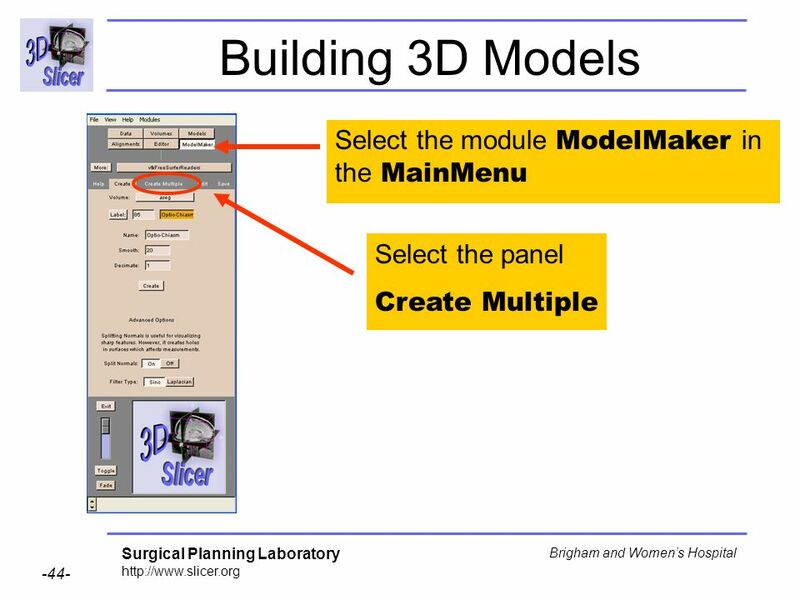 52 Building 3D Models Click in the module Models in the Main Menu and select the panel Display. 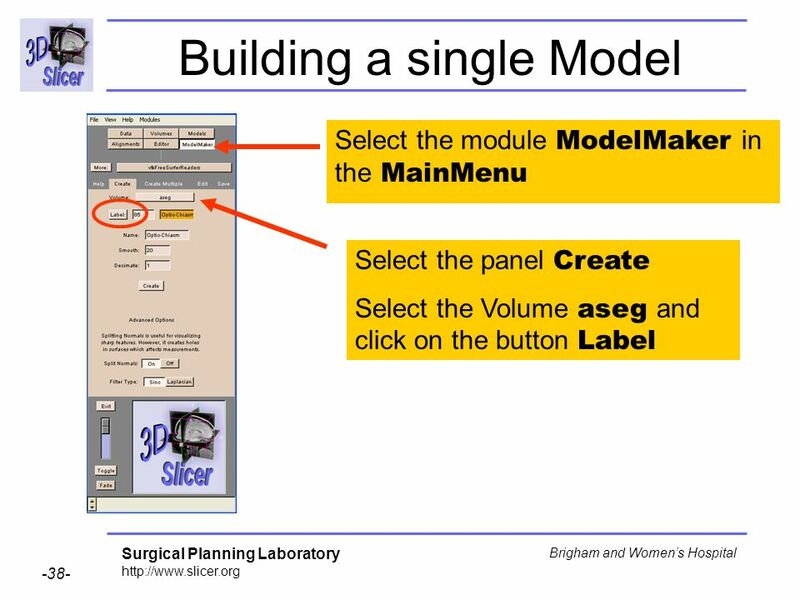 The list of models appears in the panel. 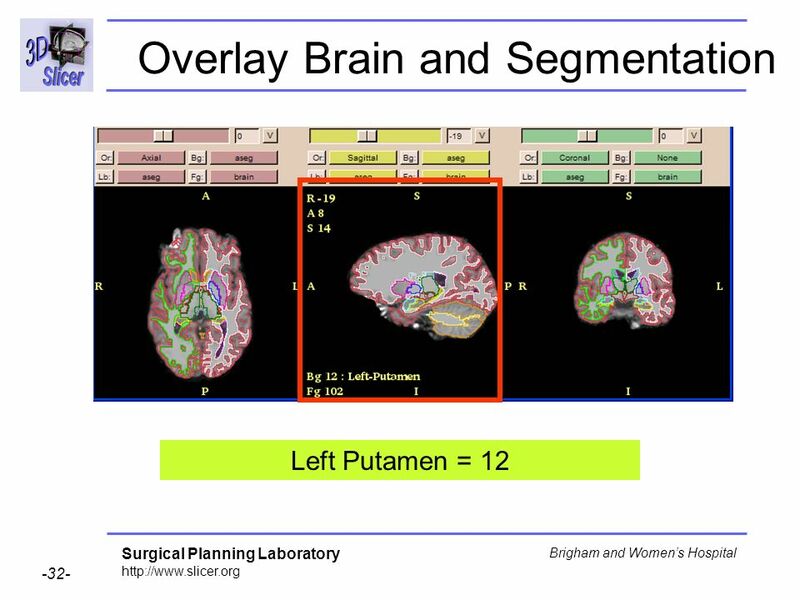 Deselect the models of the Left Putamen and Left Caudate. 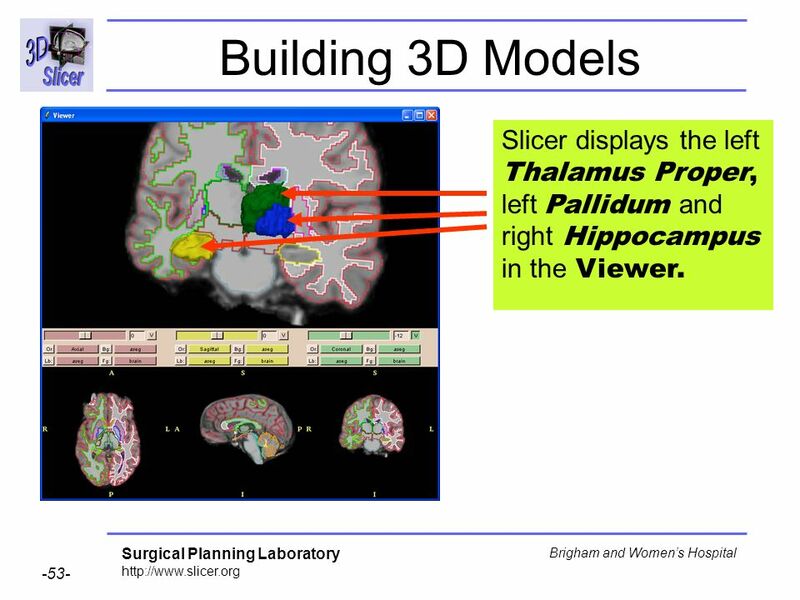 53 Building 3D Models Slicer displays the left Thalamus Proper, left Pallidum and right Hippocampus in the Viewer. 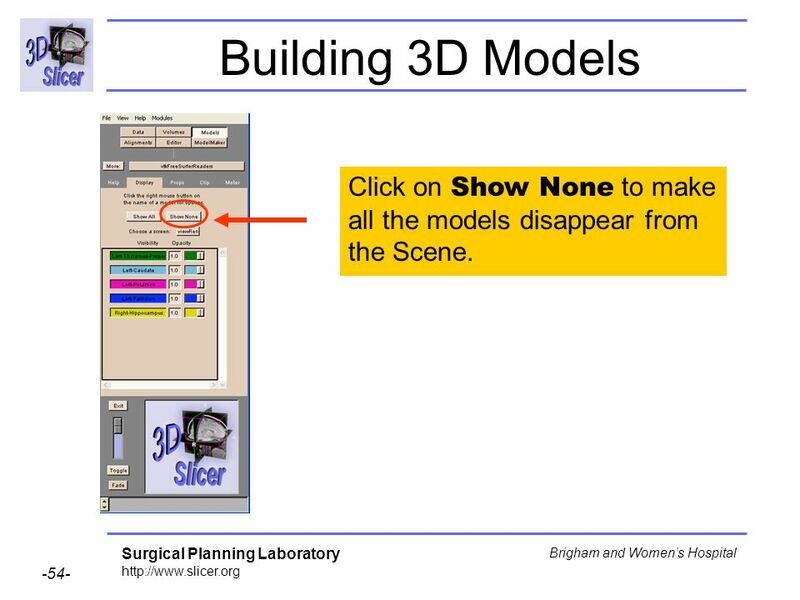 54 Building 3D Models Click on Show None to make all the models disappear from the Scene. 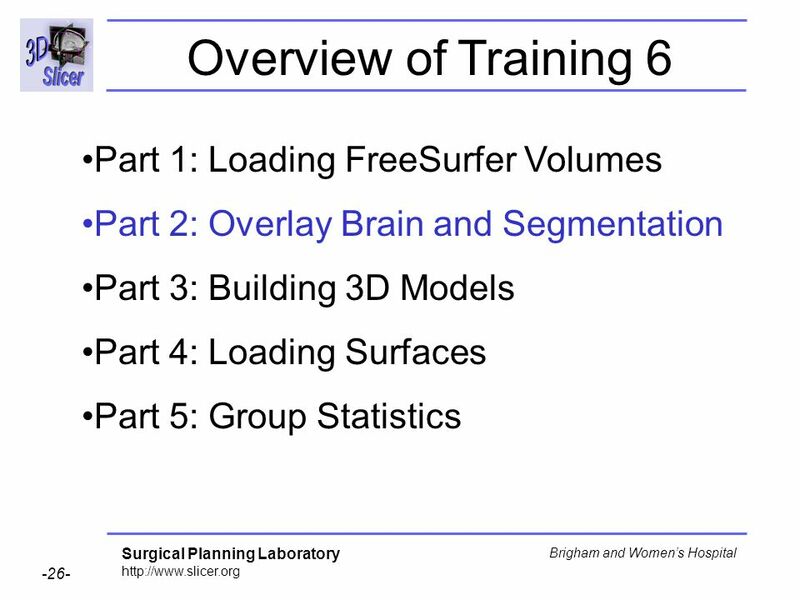 57 Loading Surfaces The name of the surface selected appears in the Models panel. 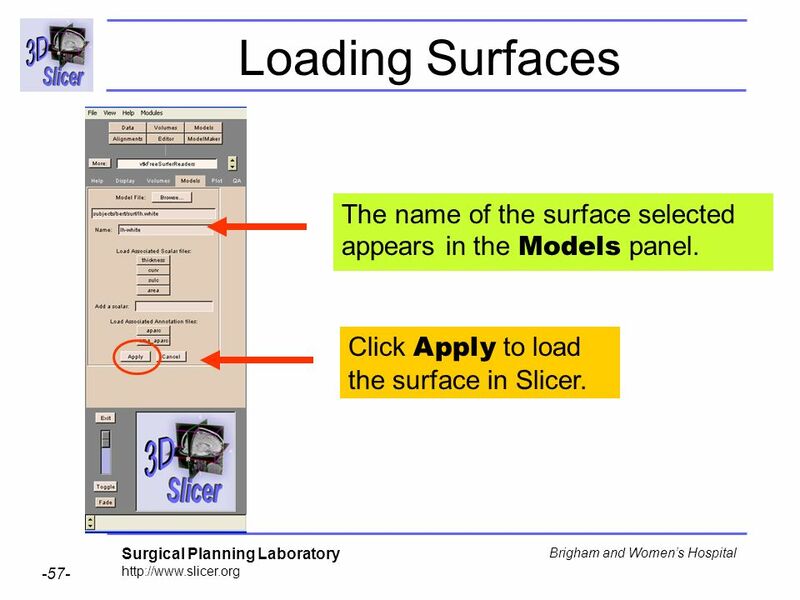 Click Apply to load the surface in Slicer. 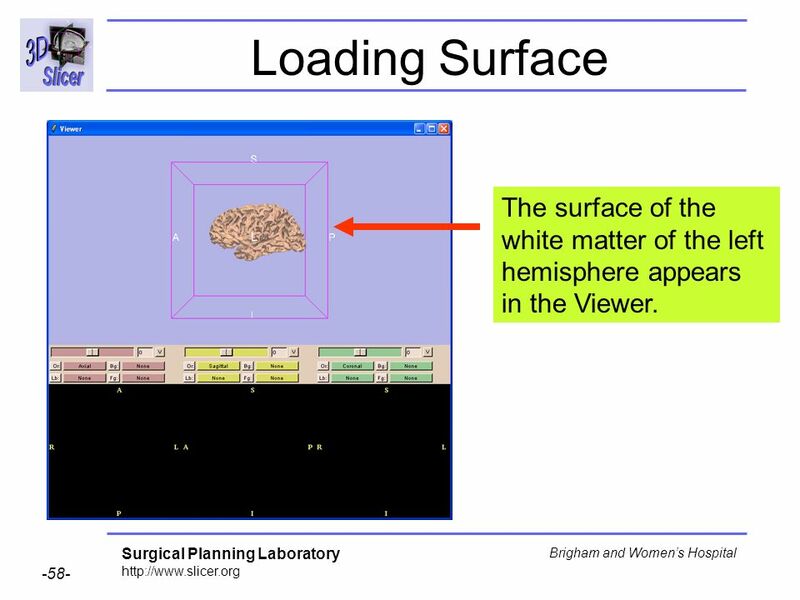 58 Loading Surface The surface of the white matter of the left hemisphere appears in the Viewer. 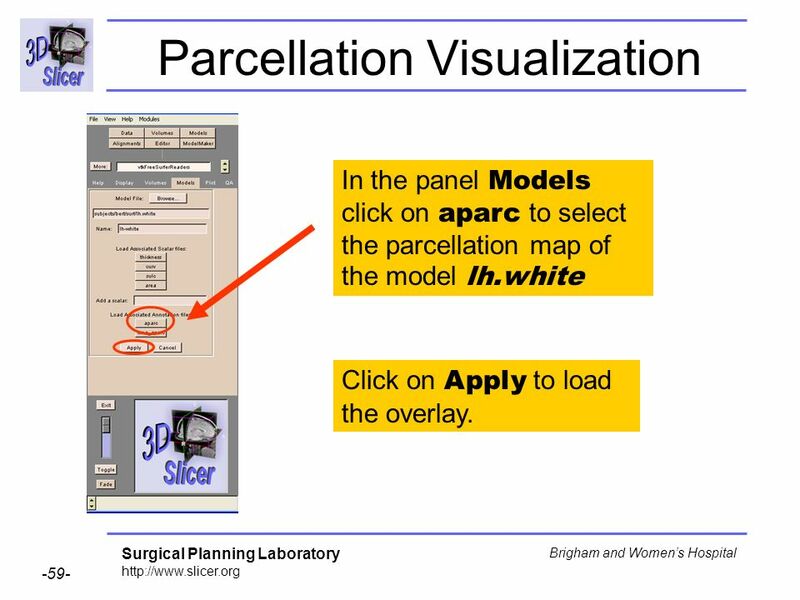 In the panel Models click on aparc to select the parcellation map of the model lh.white Click on Apply to load the overlay. 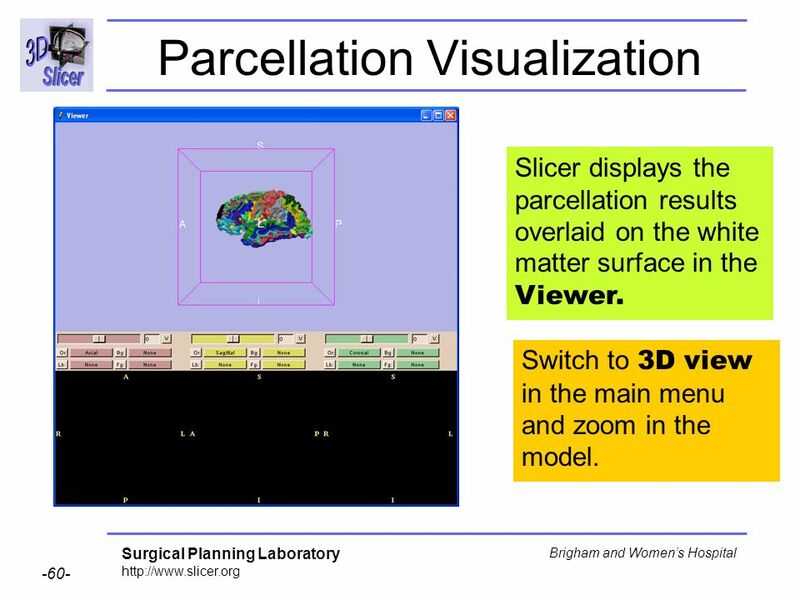 Slicer displays the parcellation results overlaid on the white matter surface in the Viewer. 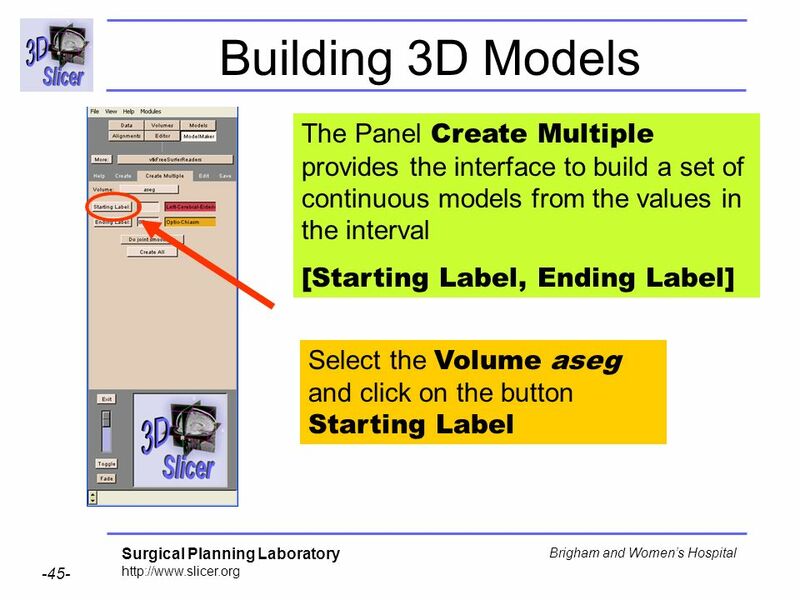 Switch to 3D view in the main menu and zoom in the model. 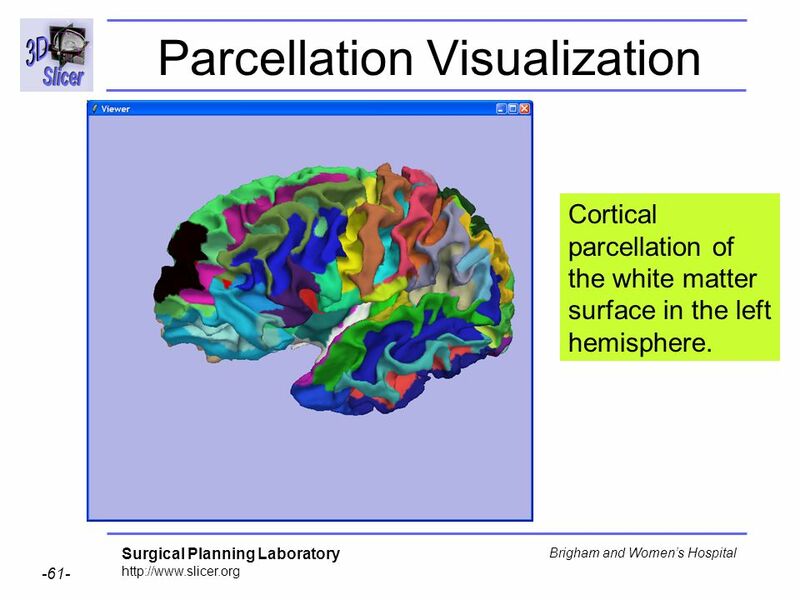 Cortical parcellation of the white matter surface in the left hemisphere. 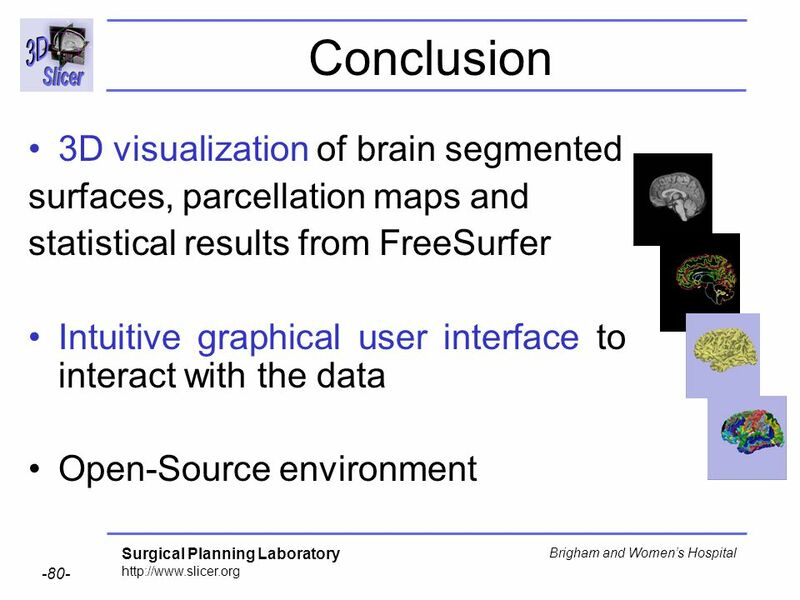 63 Group Statistics After completion of surface reconstruction for all subjects in a study, FreeSurfer can perform group averaging and statistical inference of the cortical surface measurements such as thickness. 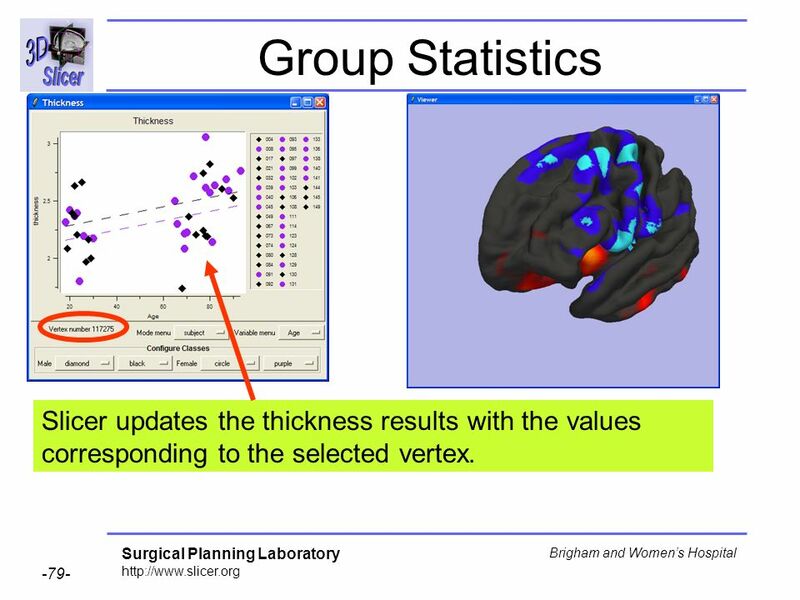 The observed data is a set of cortical surface measurements at each vertex for each subject in the group. 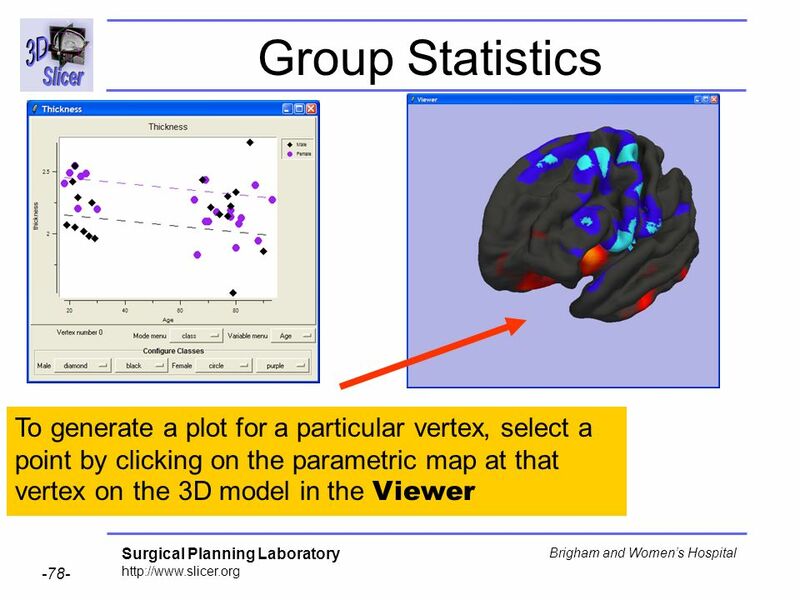 The process fits a General Linear Model at each vertex to summarize the data from all the subjects. 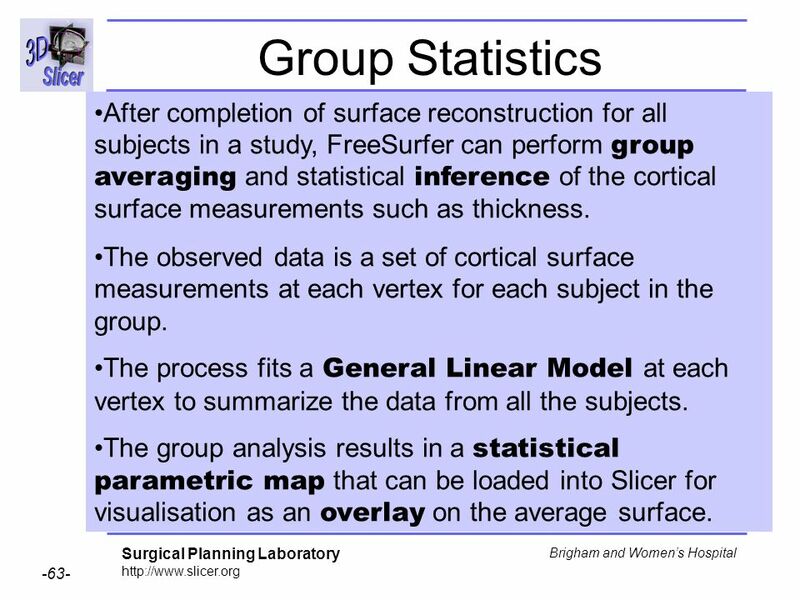 The group analysis results in a statistical parametric map that can be loaded into Slicer for visualisation as an overlay on the average surface. 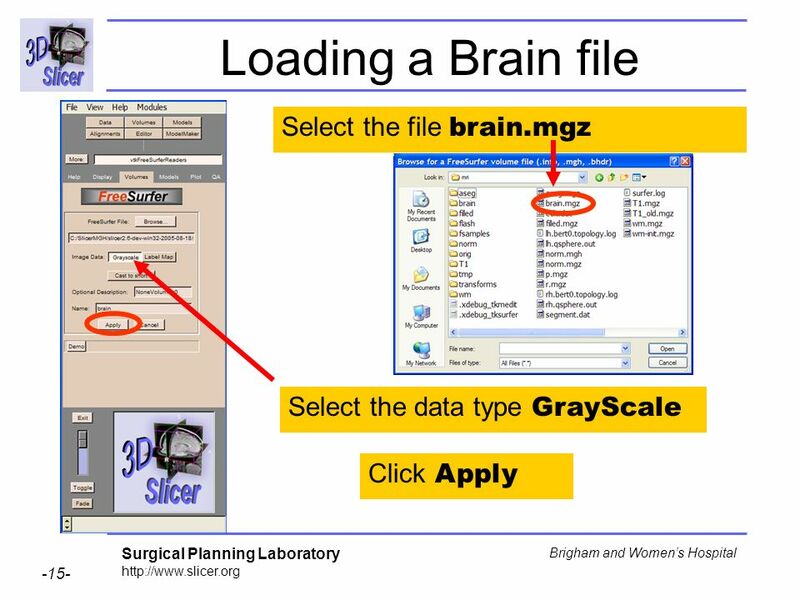 67 Click on Load Scalar File. 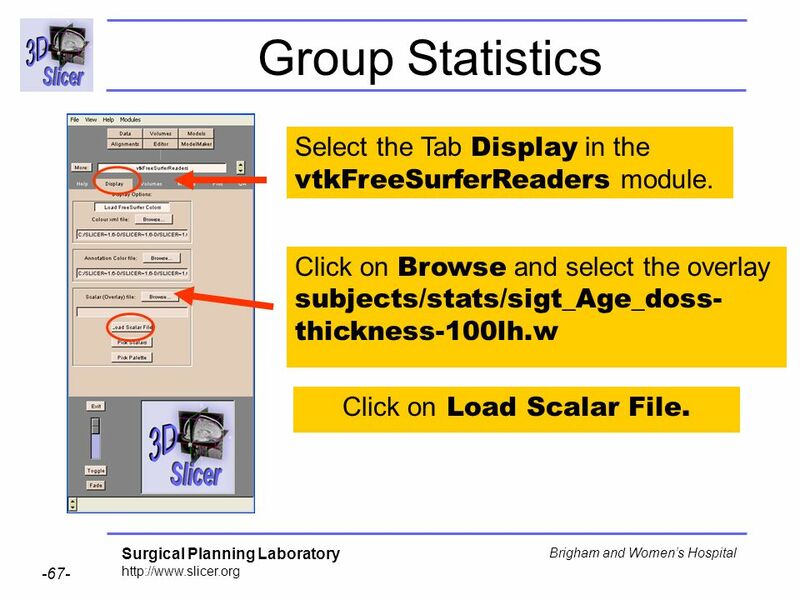 Group Statistics Select the Tab Display in the vtkFreeSurferReaders module. 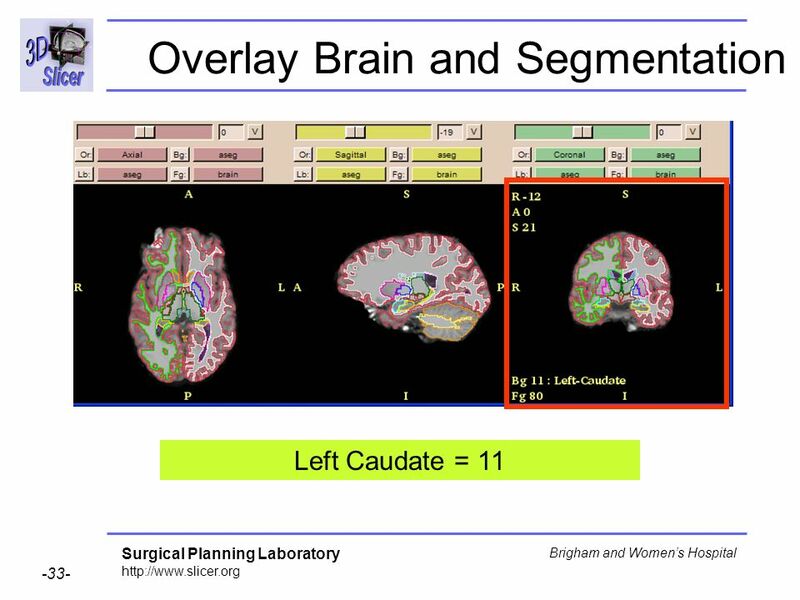 Click on Browse and select the overlay subjects/stats/sigt_Age_doss-thickness-100lh.w Click on Load Scalar File. 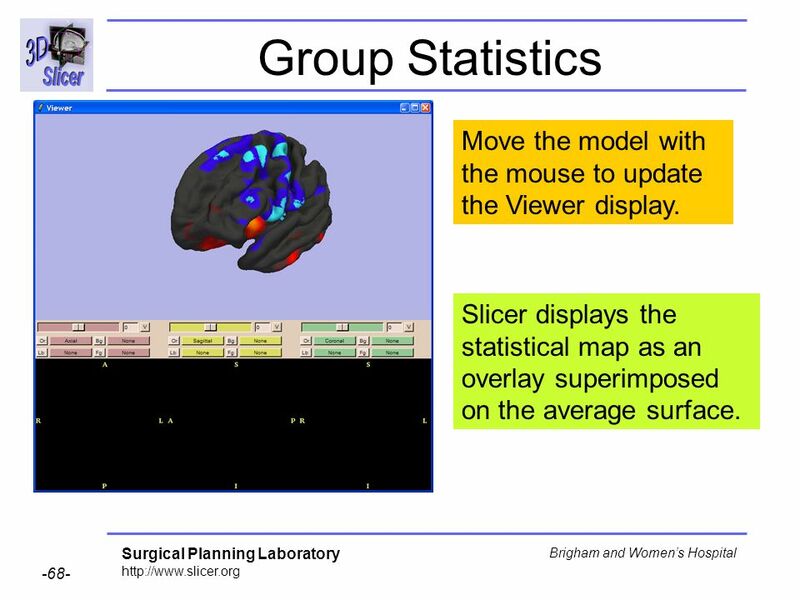 68 Group Statistics Move the model with the mouse to update the Viewer display. 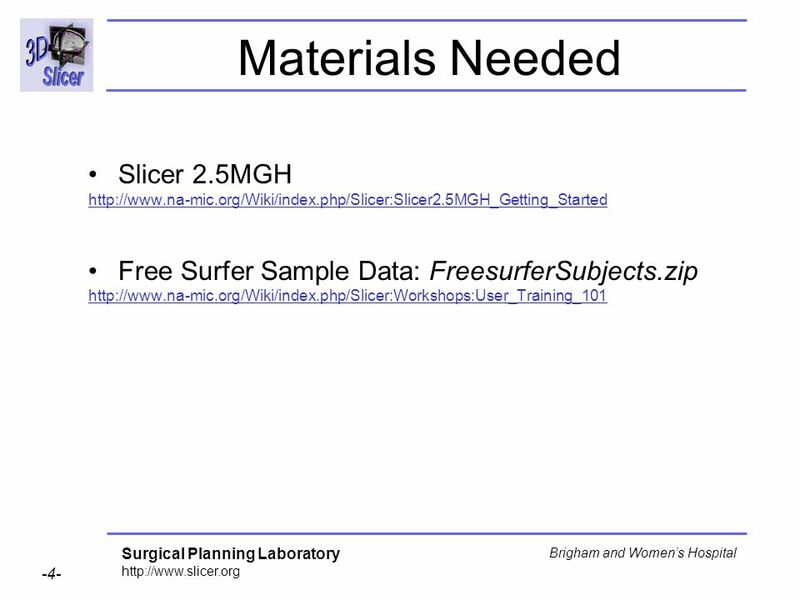 Slicer displays the statistical map as an overlay superimposed on the average surface. 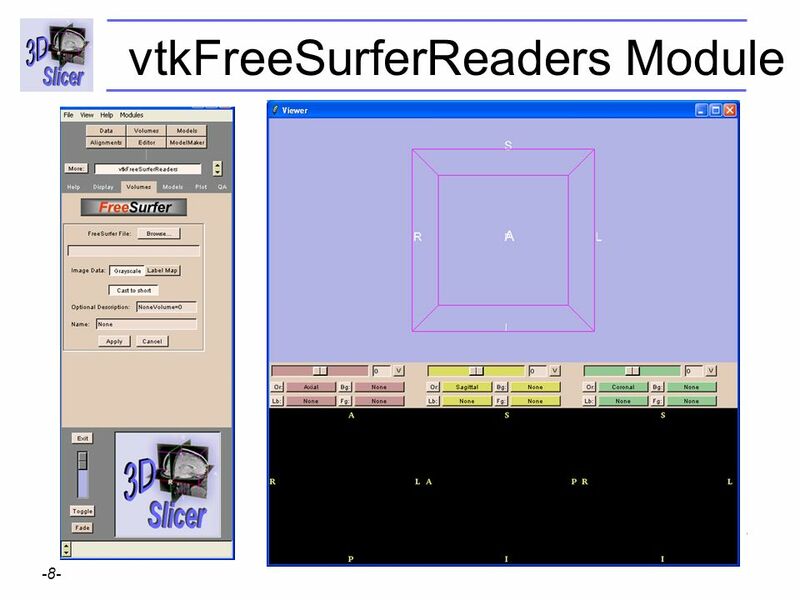 69 Group Statistics Select the Panel Plot in the vtkFreeSurferReaders module. 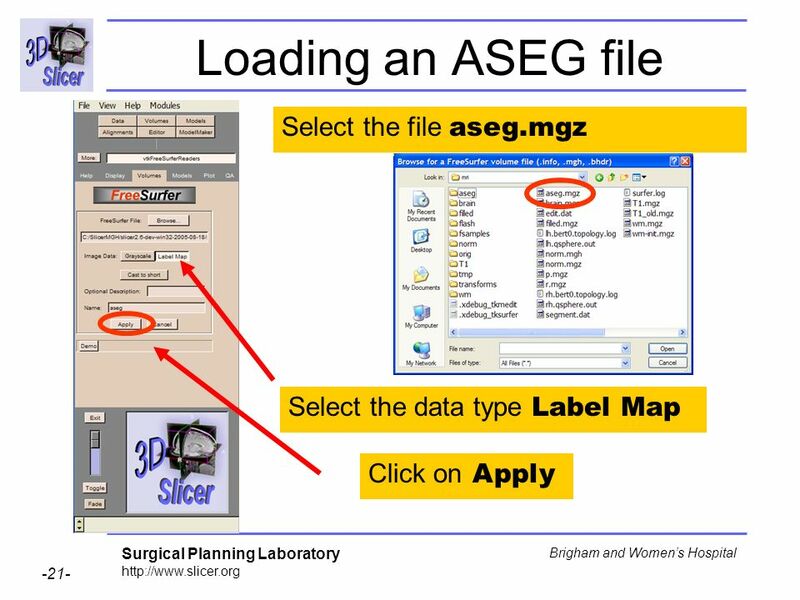 Click on Browse and select the file y_doss-thickness-100lh.fsgd in the directory subjects/stats. 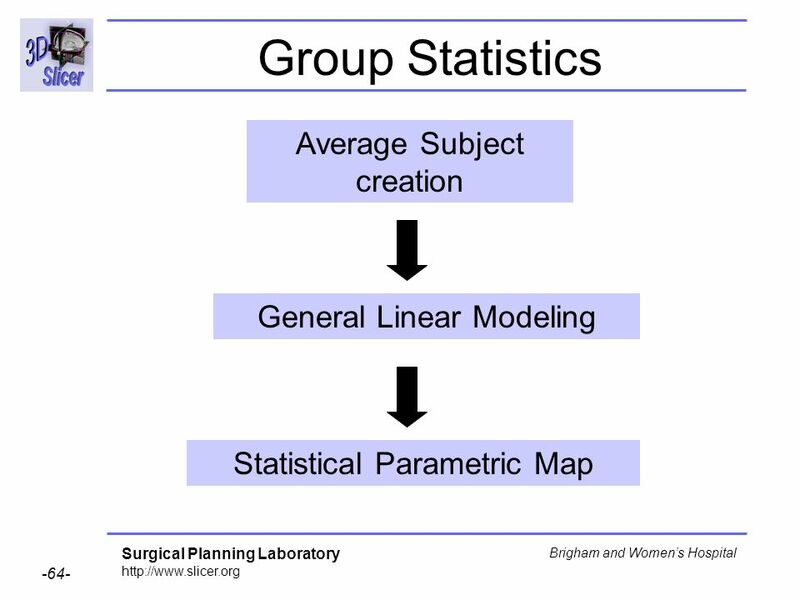 70 Group Statistics Select the Active Model lh.pial_avg in the list of models. 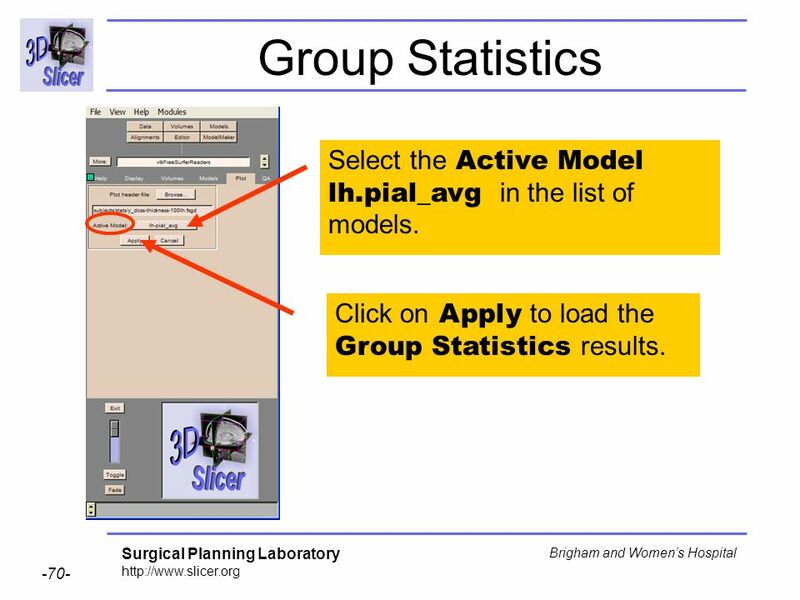 Click on Apply to load the Group Statistics results. 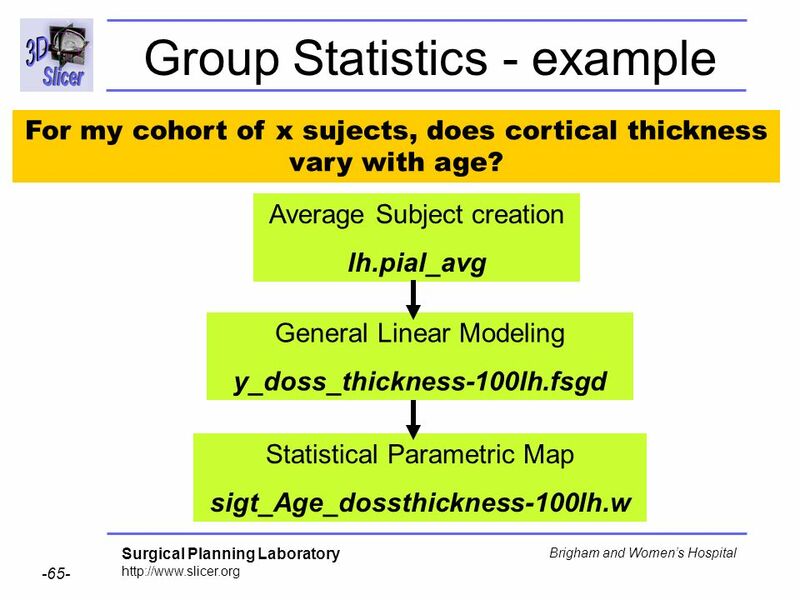 71 Group Statistics Slicer displays statistical distribution of the cortical thickness of the left hemisphere parameterized by the age of the population. 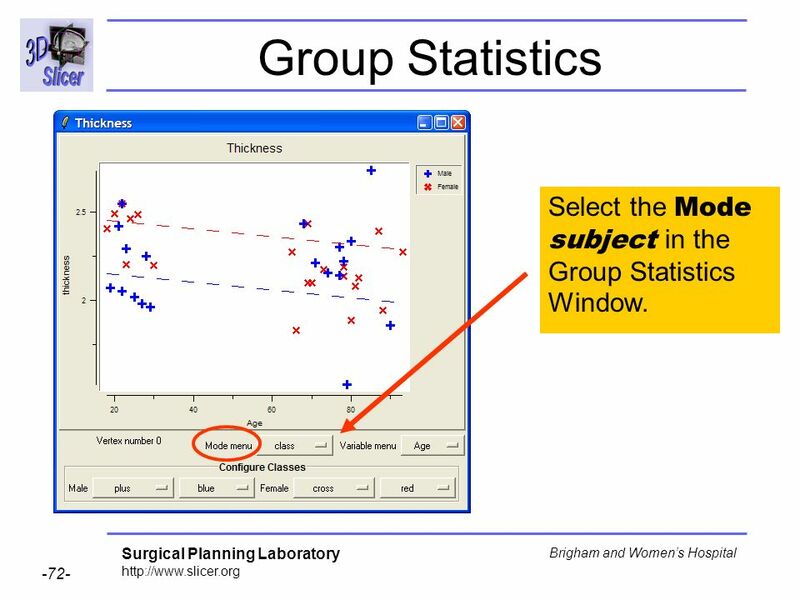 72 Group Statistics Select the Mode subject in the Group Statistics Window. 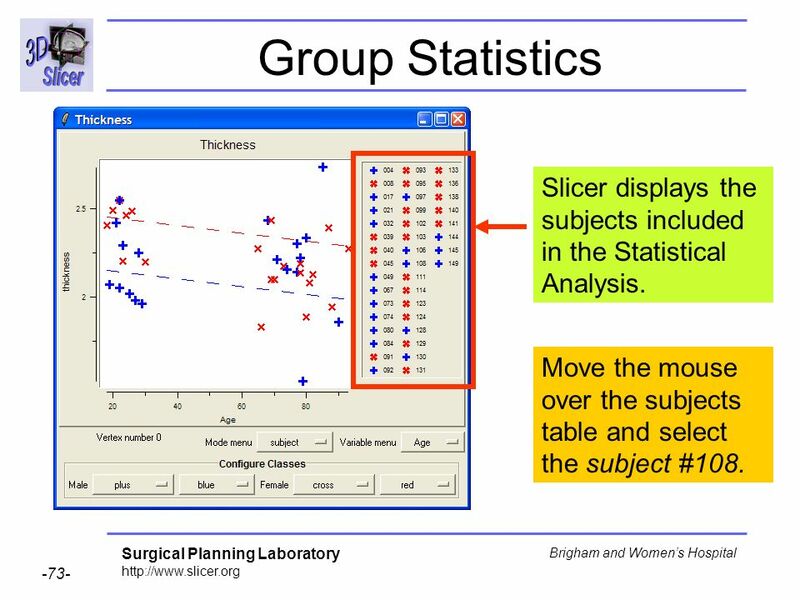 73 Group Statistics Slicer displays the subjects included in the Statistical Analysis. 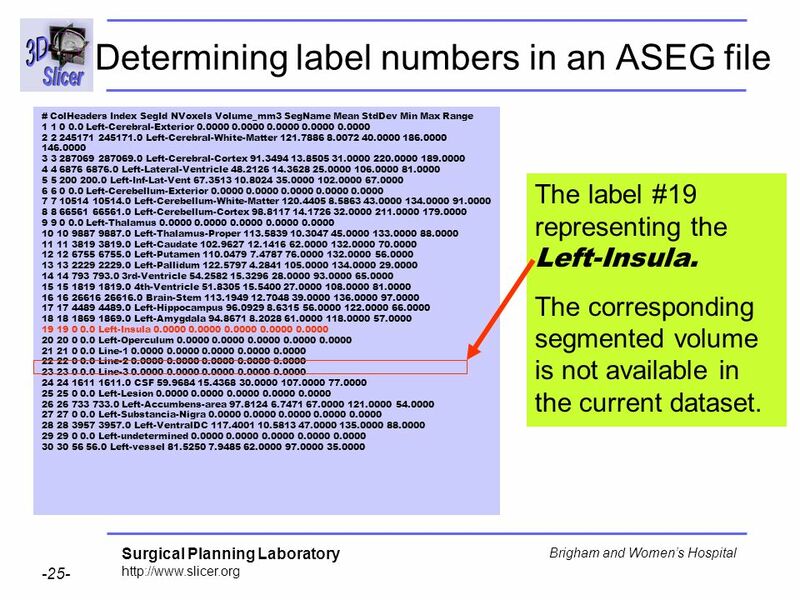 Move the mouse over the subjects table and select the subject #108. 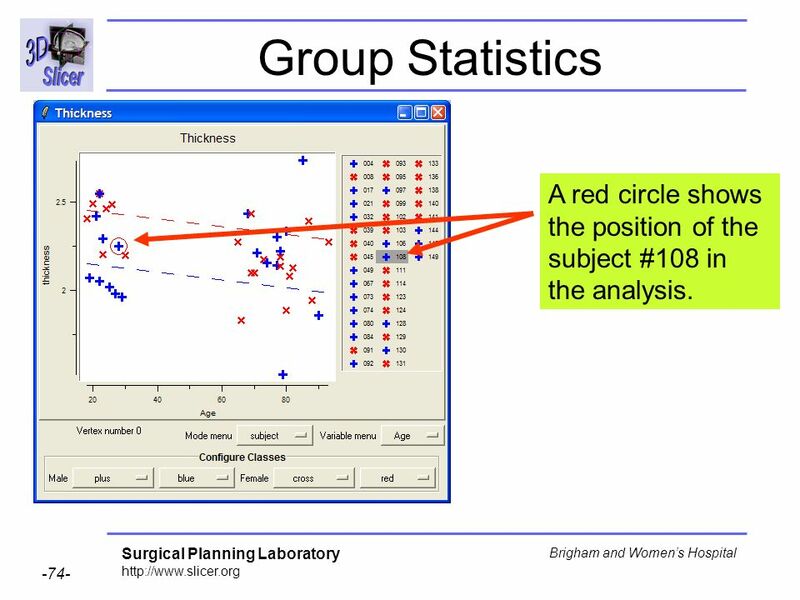 74 Group Statistics A red circle shows the position of the subject #108 in the analysis. 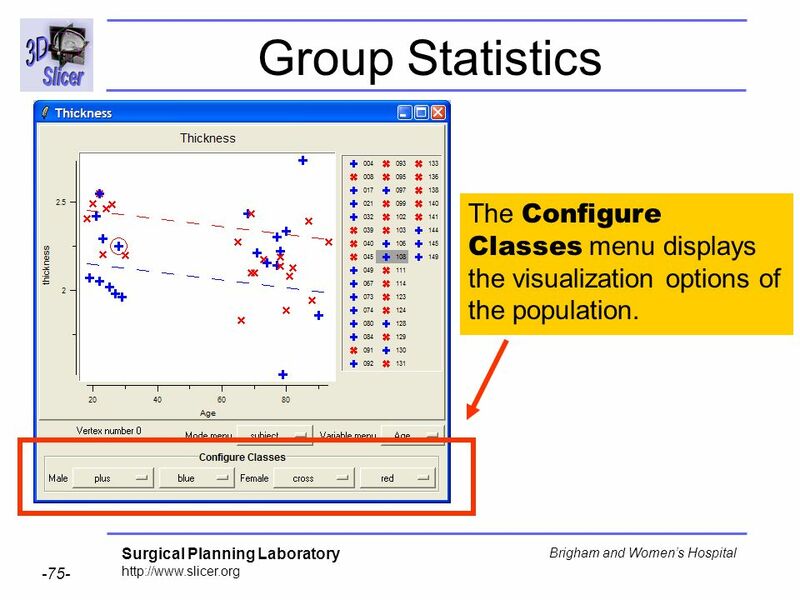 75 Group Statistics The Configure Classes menu displays the visualization options of the population. 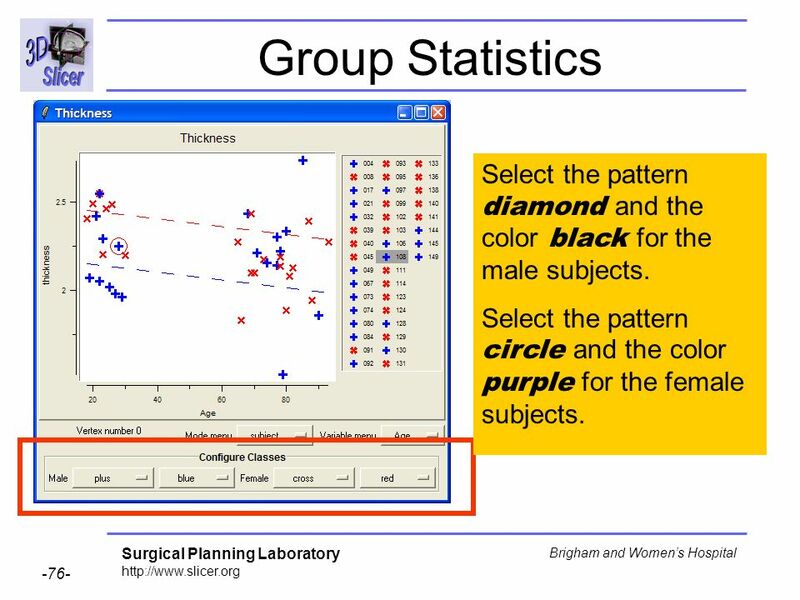 76 Group Statistics Select the pattern diamond and the color black for the male subjects. 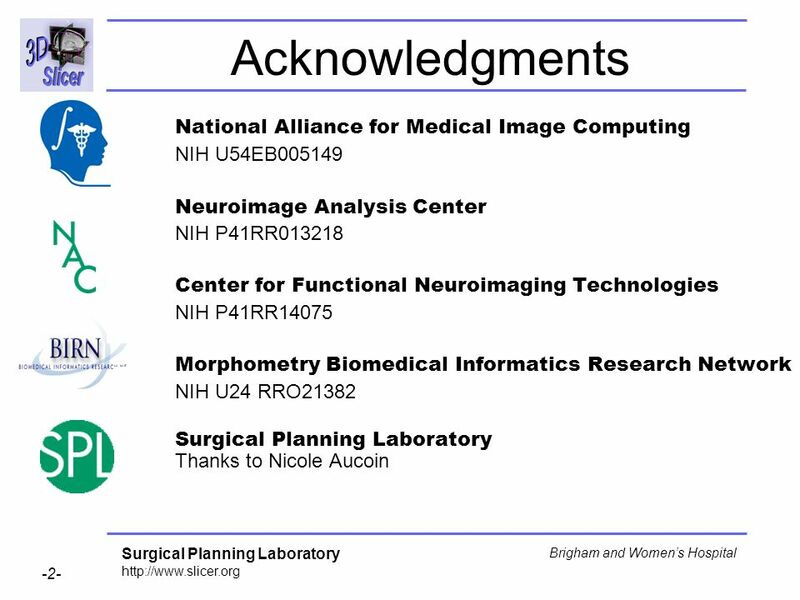 Select the pattern circle and the color purple for the female subjects. 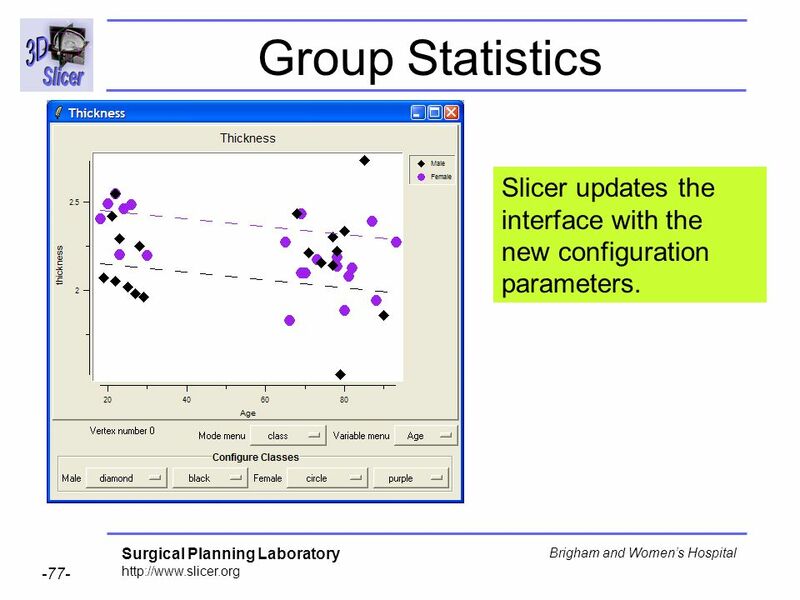 77 Group Statistics Slicer updates the interface with the new configuration parameters. 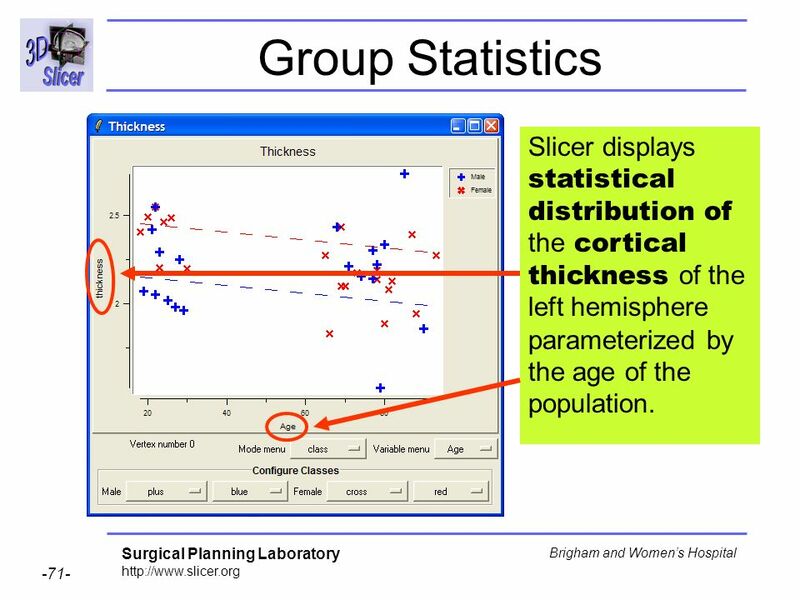 79 Group Statistics Slicer updates the thickness results with the values corresponding to the selected vertex. 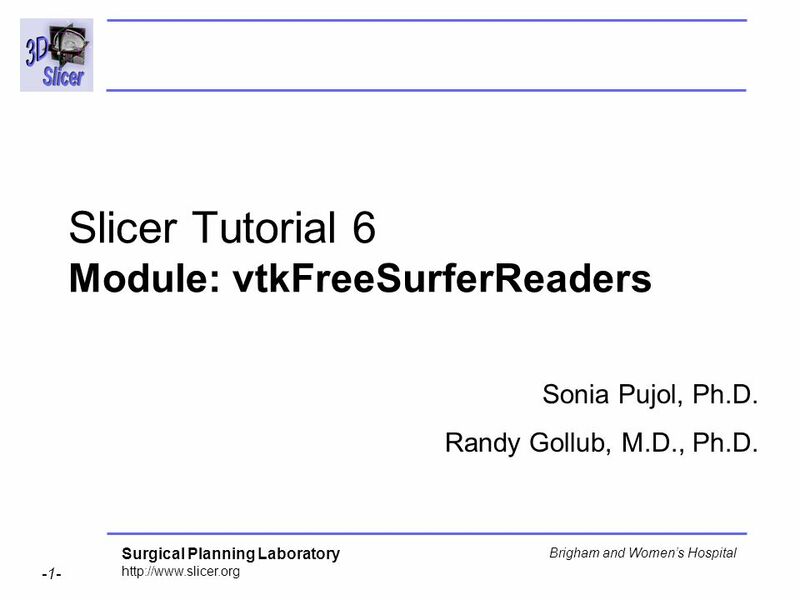 Download ppt "Slicer Tutorial 6 Module: vtkFreeSurferReaders"
Pujol S, Gollub R -1- National Alliance for Medical Image Computing Data Loading and Visualization Sonia Pujol, PhD Randy Gollub, MD, PhD Slicer3 Training.